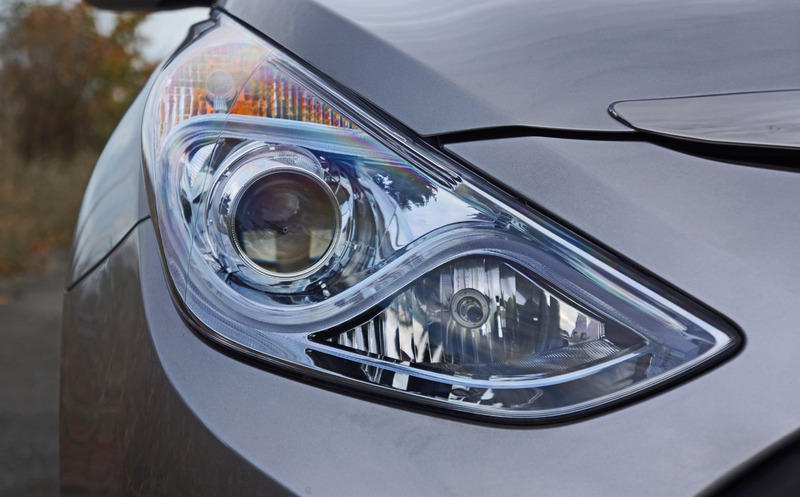 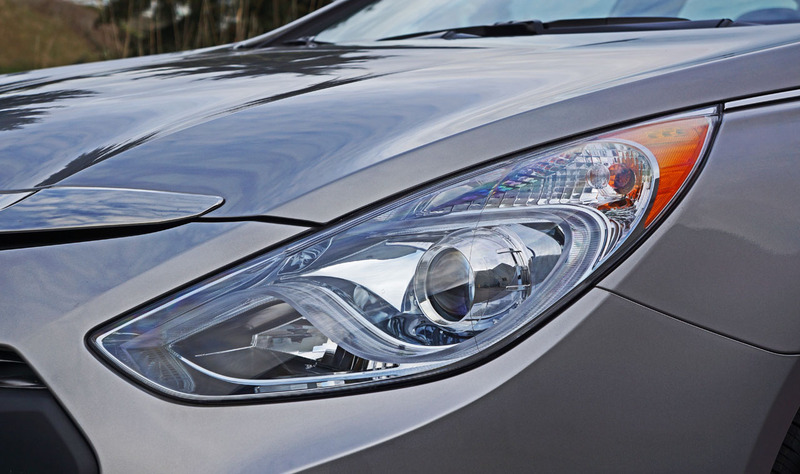 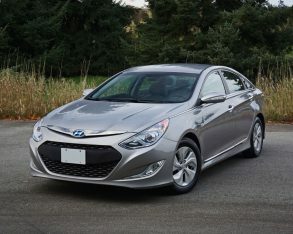 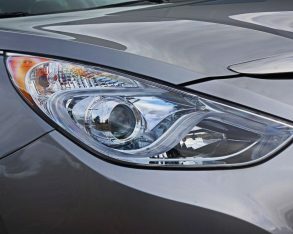 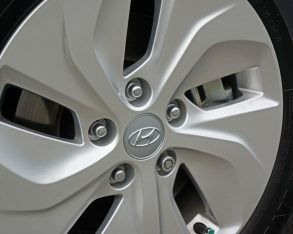 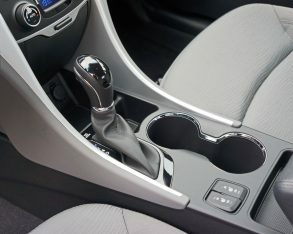 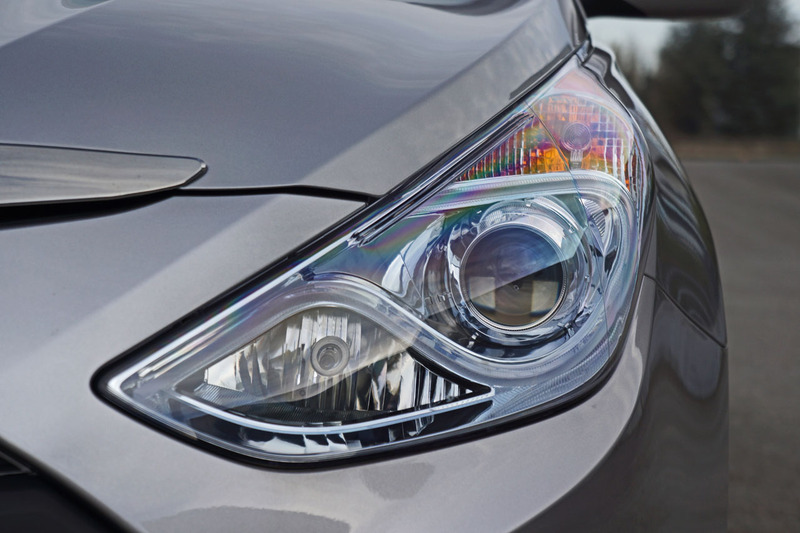 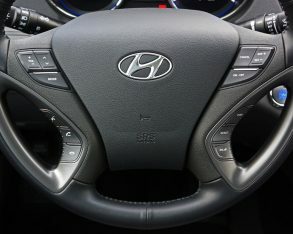 already, but before seeing this review you might not have put Hyundai on your HEV shopping list. 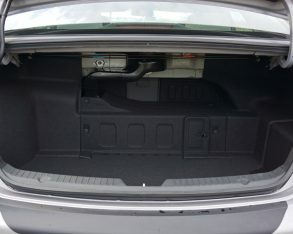 Ahead of delving any further into details, I’m going to recommend you do. 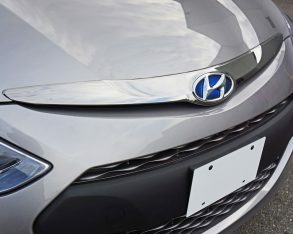 Hyundai was a bit late to the HEV game, but its single entry is no less impressive than what green sector leaders Toyota, Honda and Ford have developed. 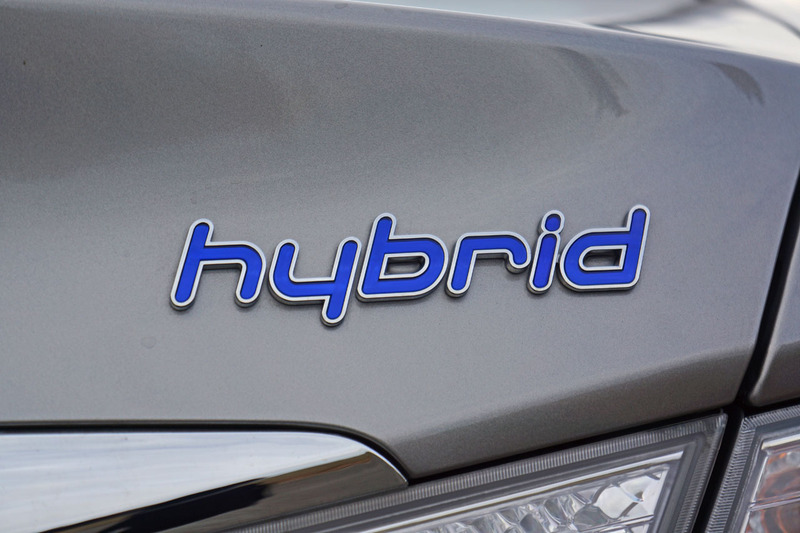 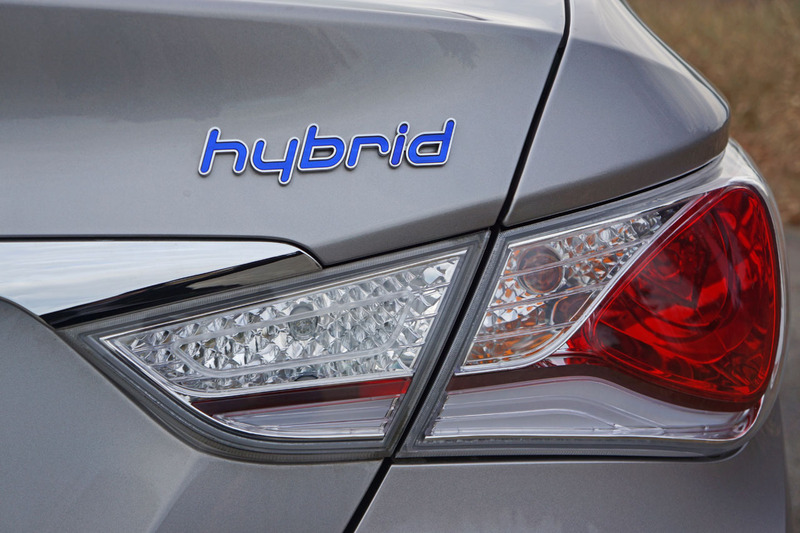 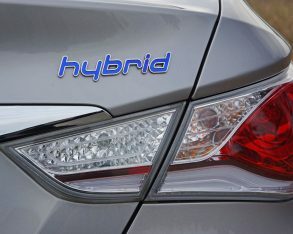 It goes up against these brands’ respective Camry Hybrid, Accord Hybrid and Fusion Hybrid models amongst others, and truly deserves to be lumped into this Japanese American mix. 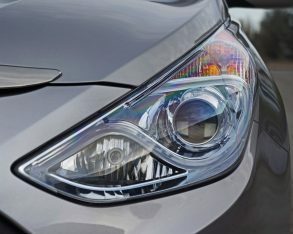 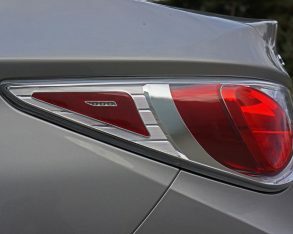 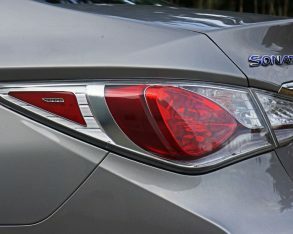 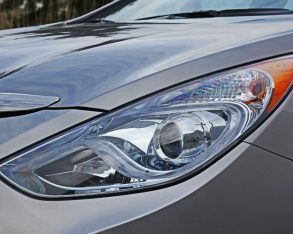 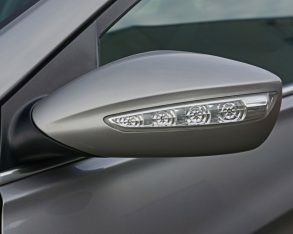 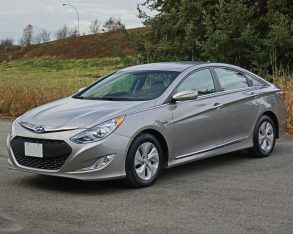 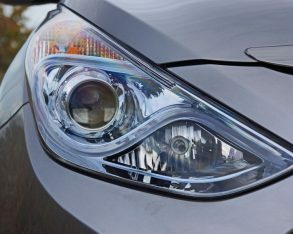 And I’m not just talking about its gracefully sporty styling, the Hybrid version being a unique take on the South Korean brand’s much-lauded sixth-generation Sonata design. 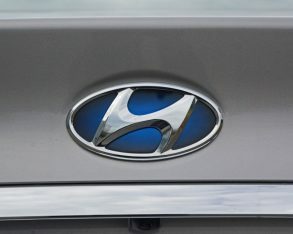 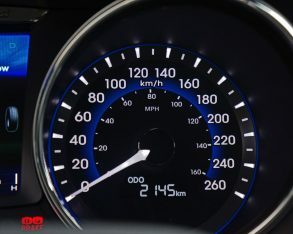 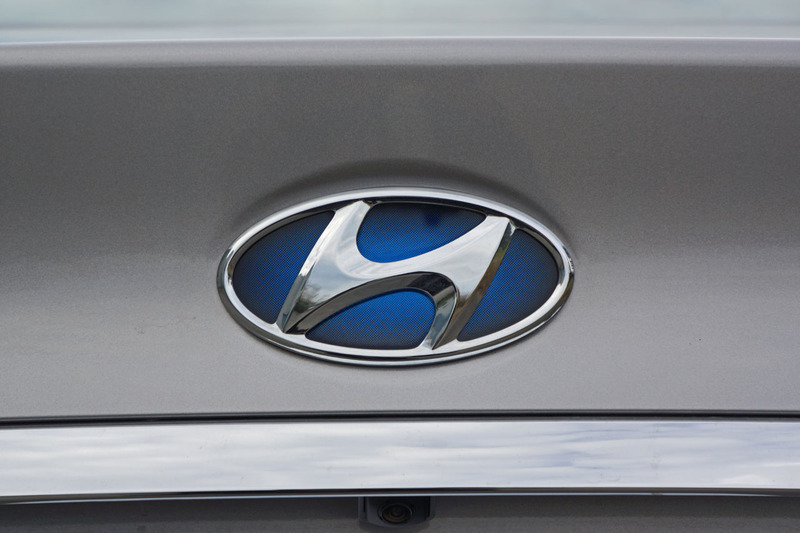 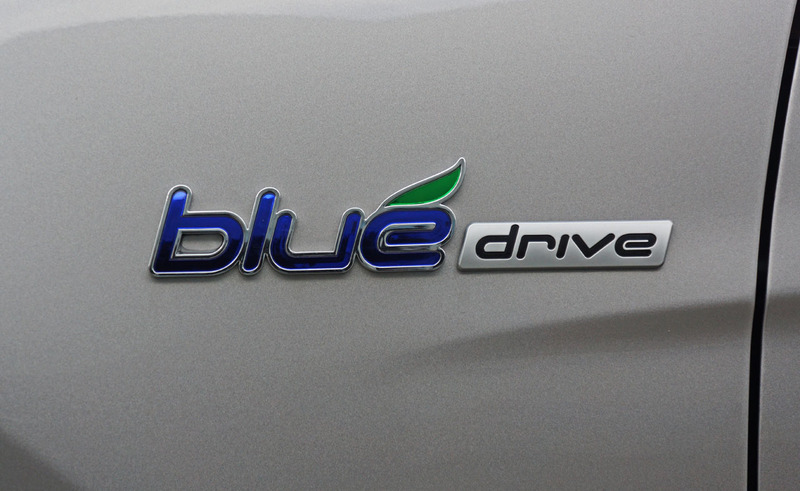 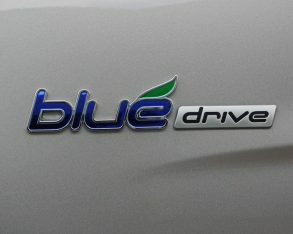 the subtleties of the blue logo up front certain that this is Hyundai’s answer to climate change, while the blue theme continues on the car’s hind end where another hybrid badge along with the car’s “SONATA” lettering and an additional Hyundai logo visually pop with the same pantone 286c highlighter. 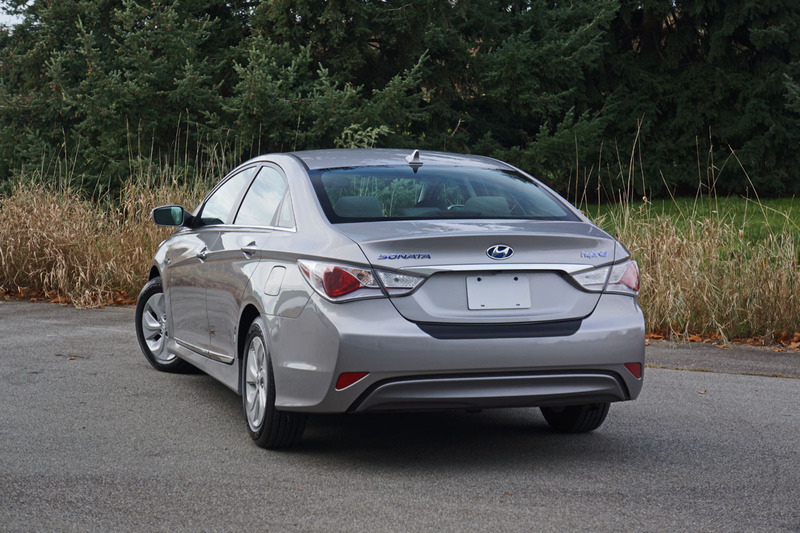 A nice set of clear and red LED taillights enhance the look, but branding on its flanks aside the biggest hybrid giveaway has to be its enviro-style wheels that were obviously designed for aerodynamics first and foremost due to their wind tunnel-honed ultra-thick five-spoke shape. 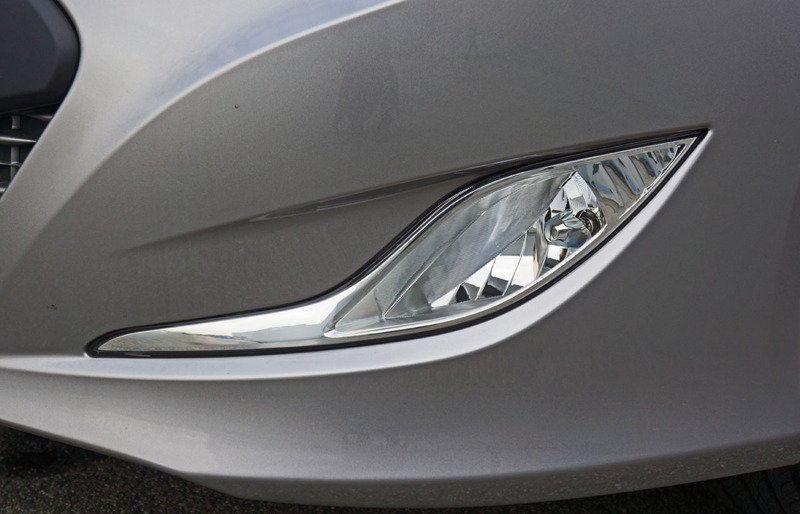 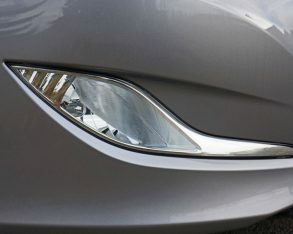 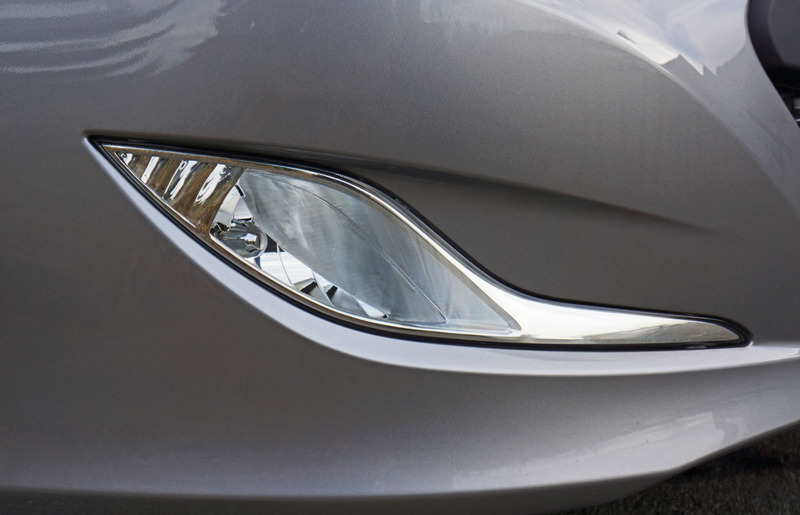 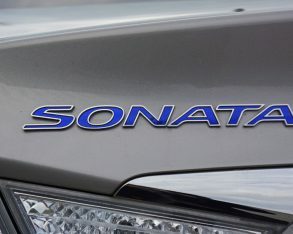 Another bonus to the current Sonata Hybrid styling is that it carries forward unchanged into 2015, the ground-up redesign only affecting conventionally powered Sonatas. 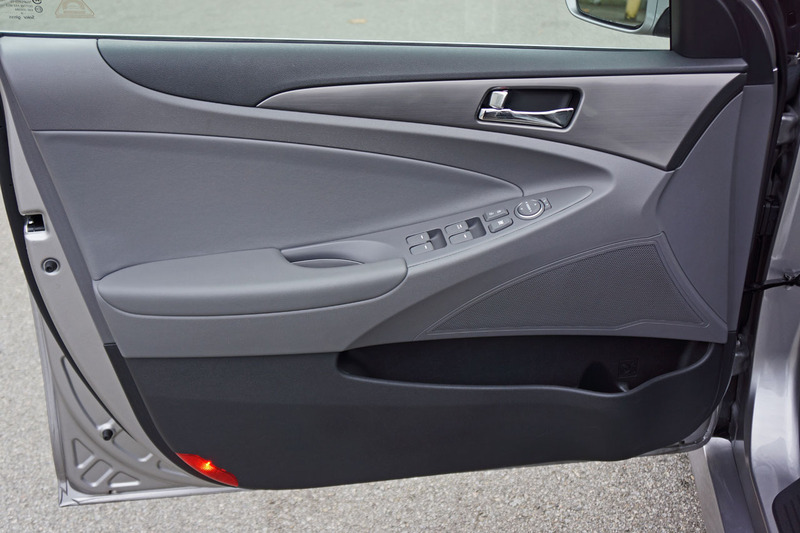 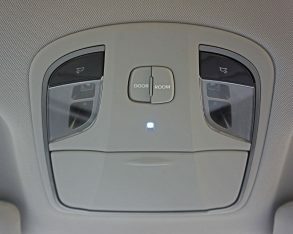 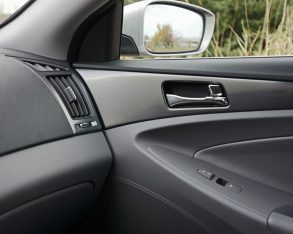 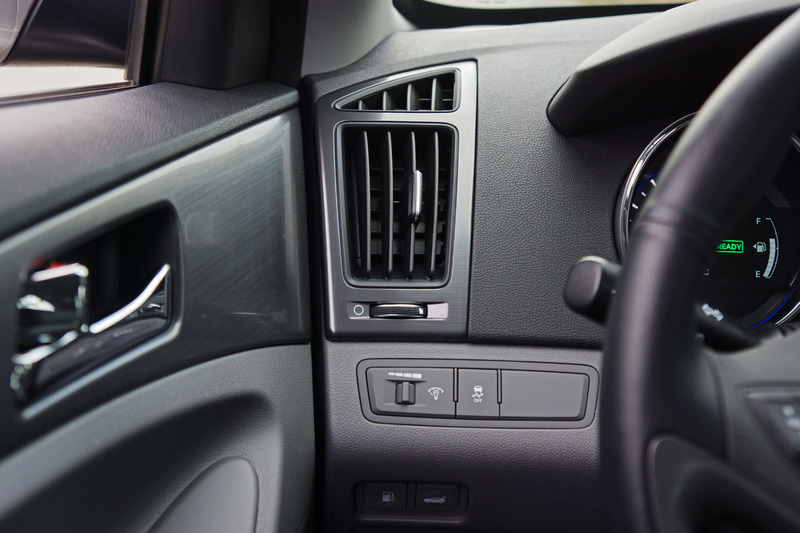 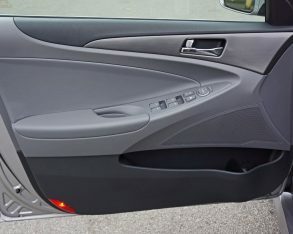 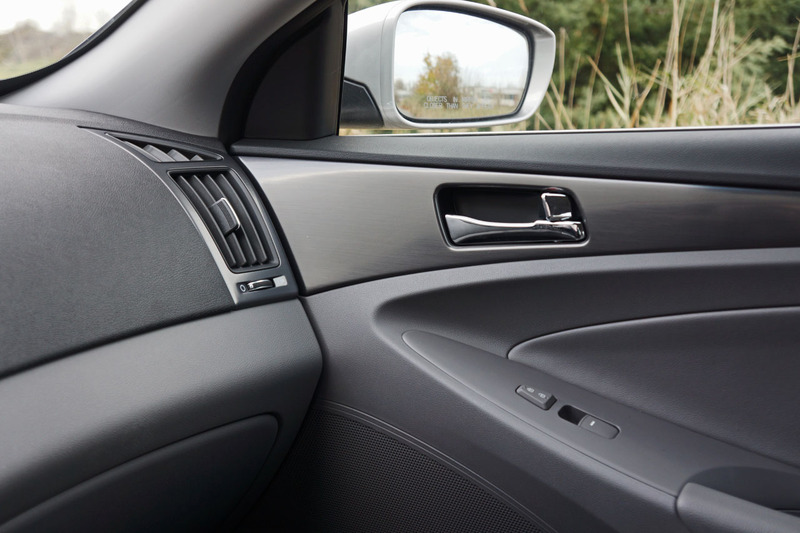 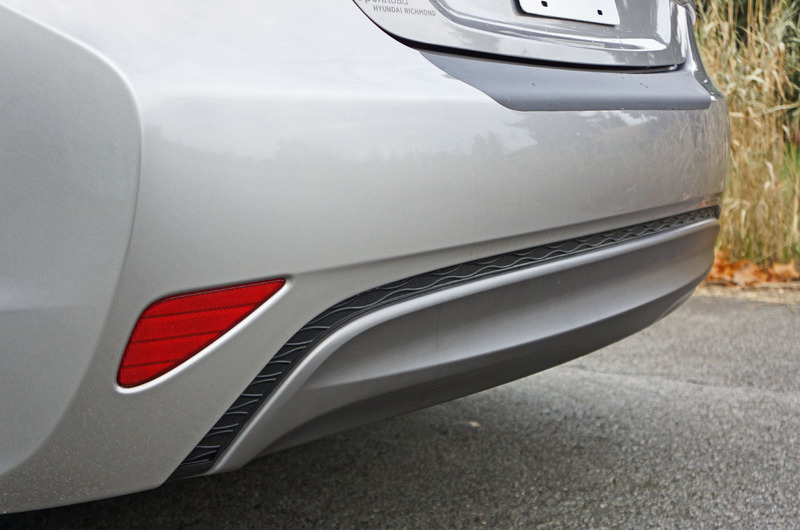 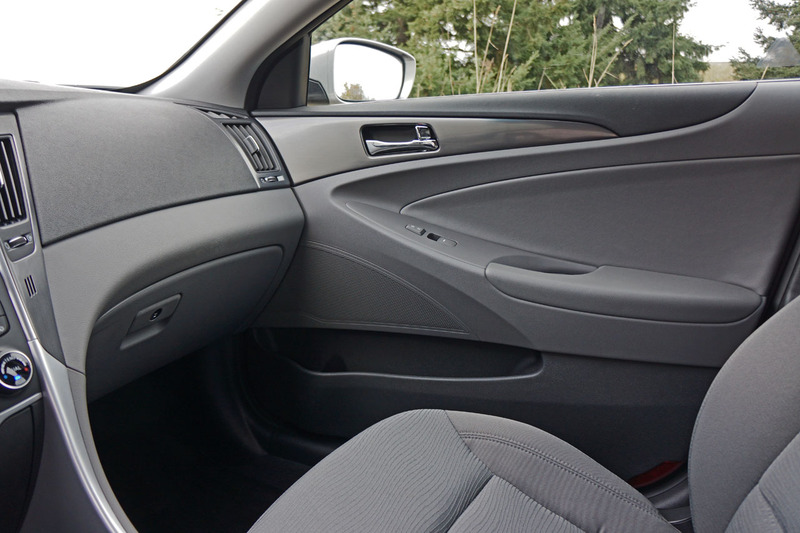 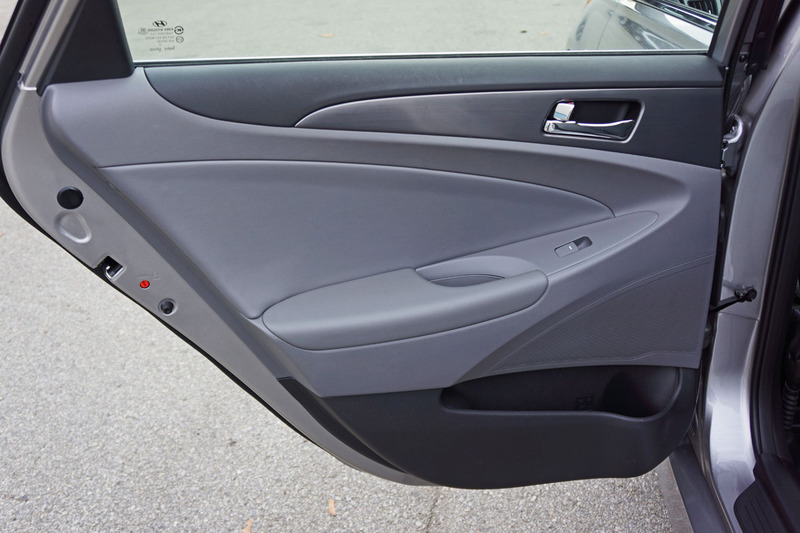 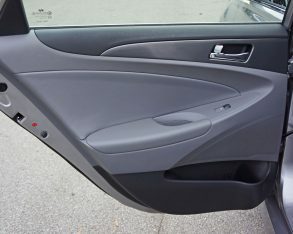 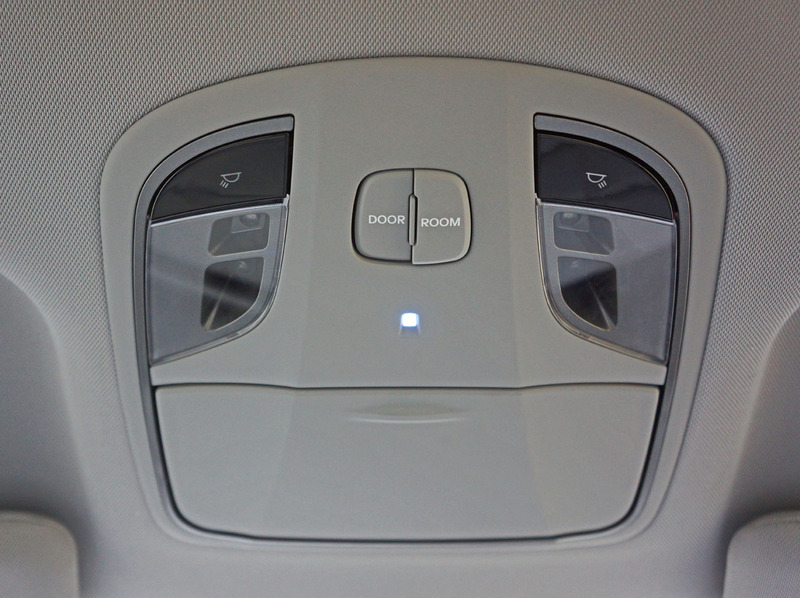 a soft-touch dash-top joins soft-touch door uppers front and back for a quality feel and good sound absorption, although most other surfaces are made up of the midsize segment’s usual harder plastic, but it’s nicely textured and looks good. 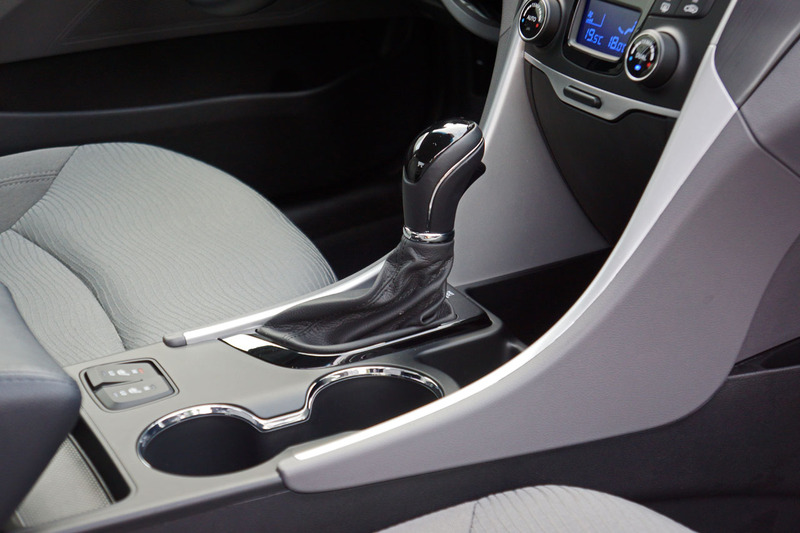 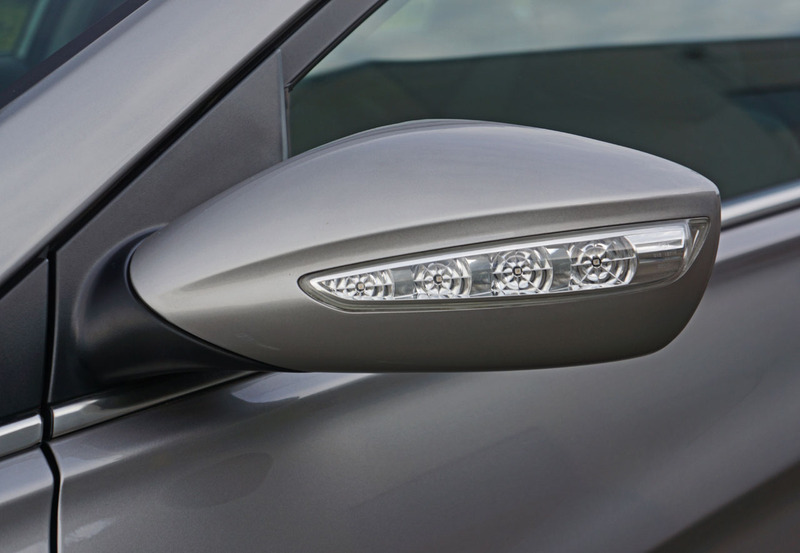 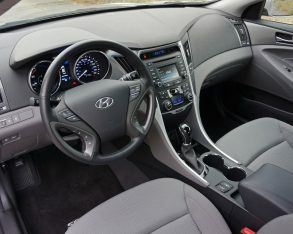 Attractive metallic trim surrounds the centre console while plenty of chrome detailing brightens up the cabin and looks especially good around the circular tachometer and speedometer, the front cupholders and door handles. 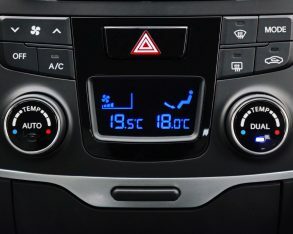 These last items are surrounded by a gloss silver surfacing treatment that’s much more appealing to my eyes than faux wood or fake carbon fibre, while more functional Eco Guide gauges are housed within the electroluminescent instrument dials, and between the tach and speedo is a great looking full-colour 4.2-inch TFT LCD multi-information screen that includes hybrid drive information. 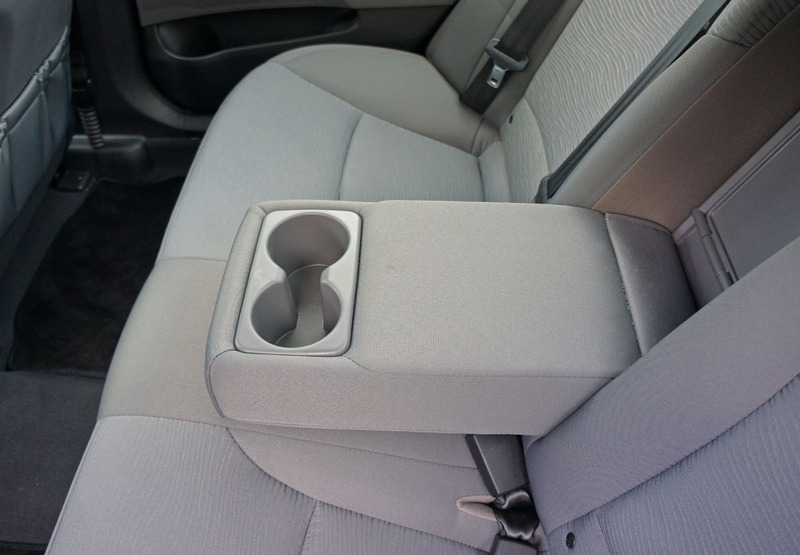 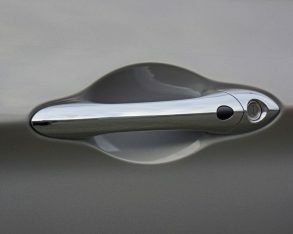 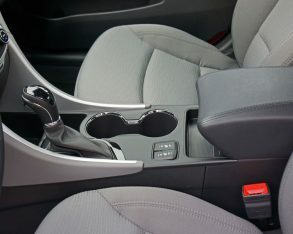 capability, plus Bluetooth hands-free of course. 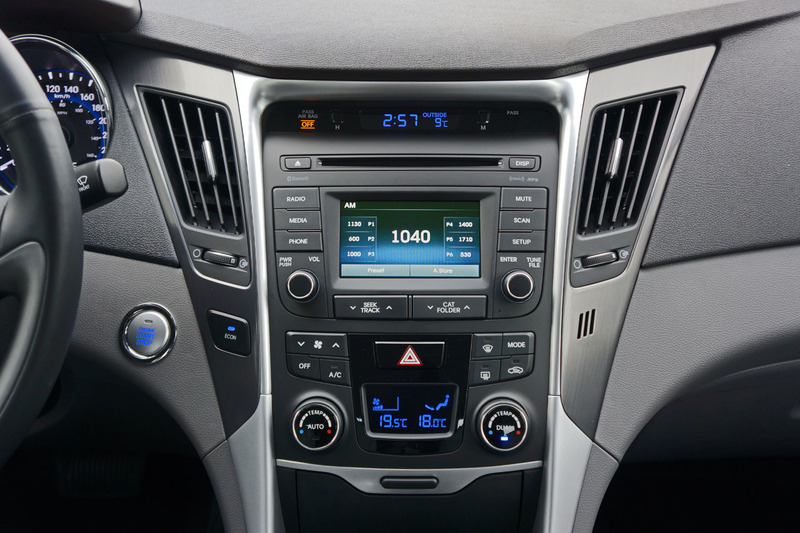 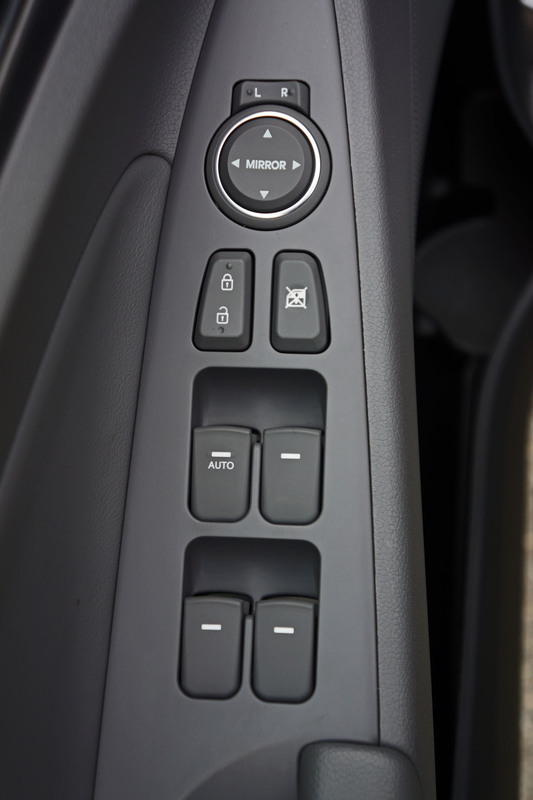 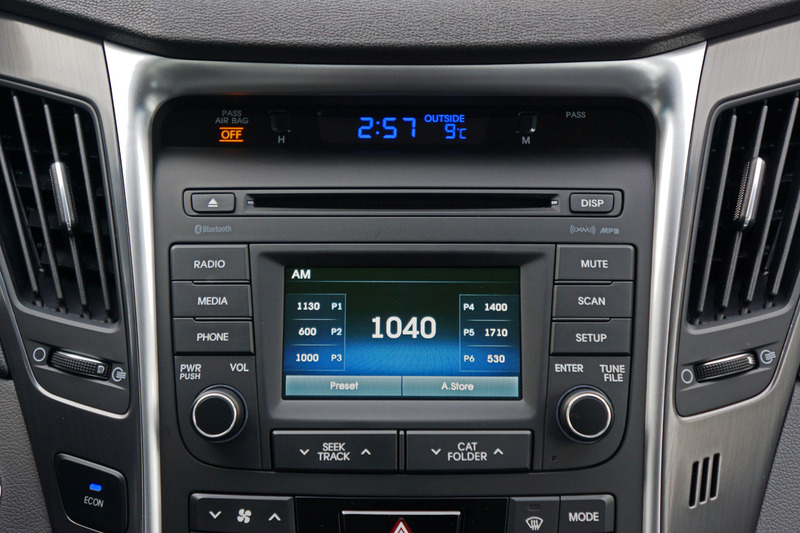 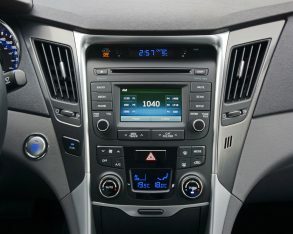 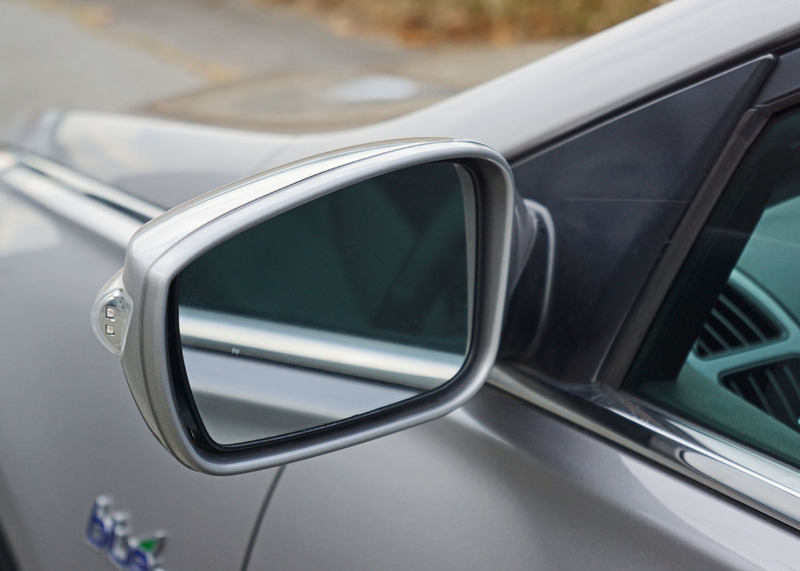 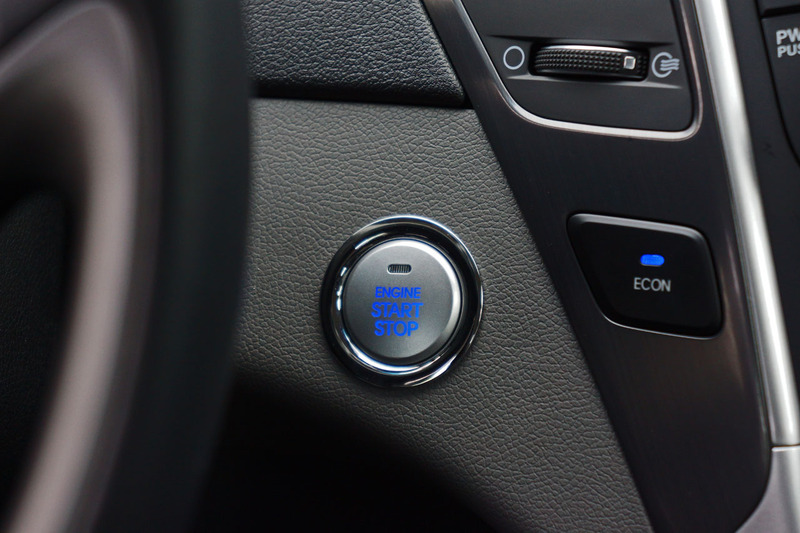 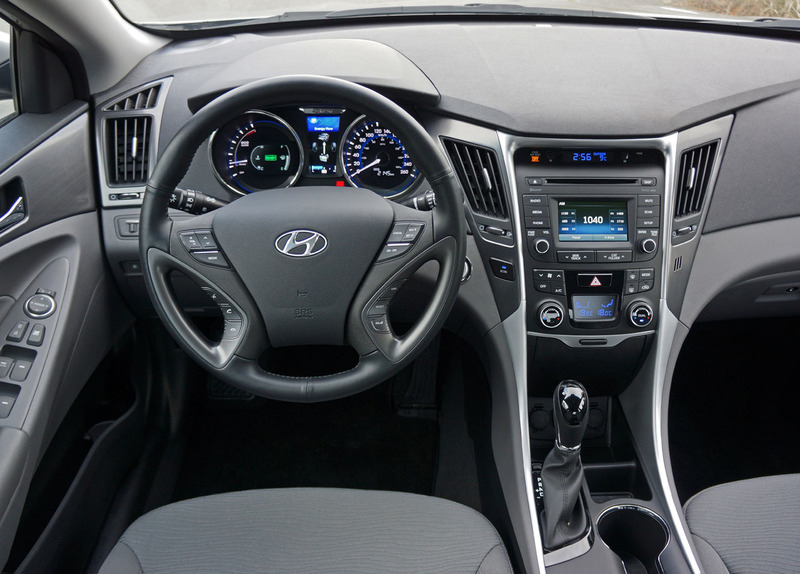 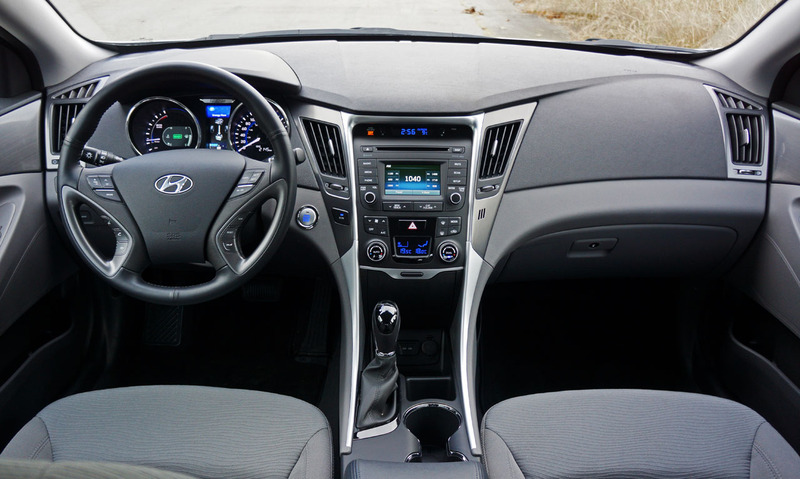 Just below the audio interface is the Sonata Hybrid’s dual-zone automatic climate control panel, easy to use and capable of making the cabin as comfortable an environment as possible. 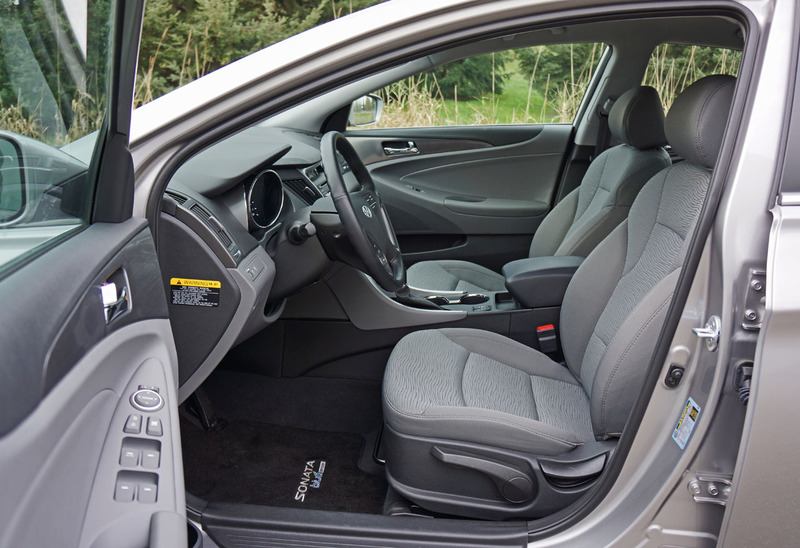 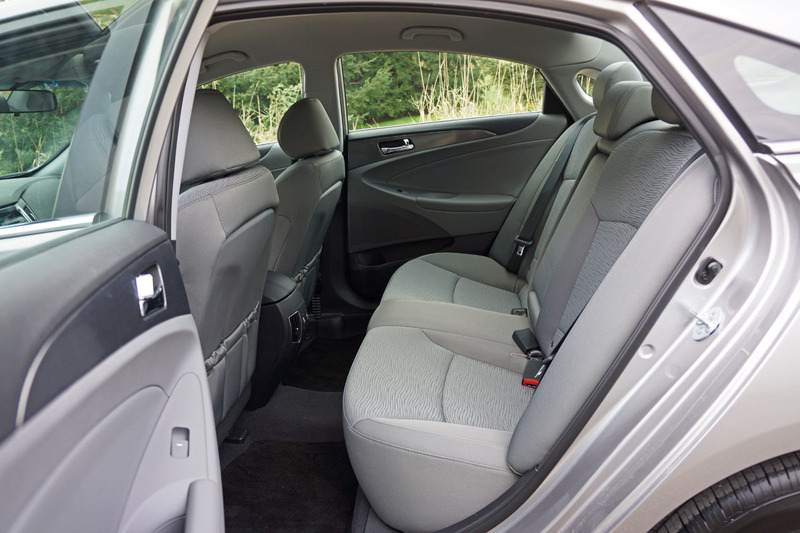 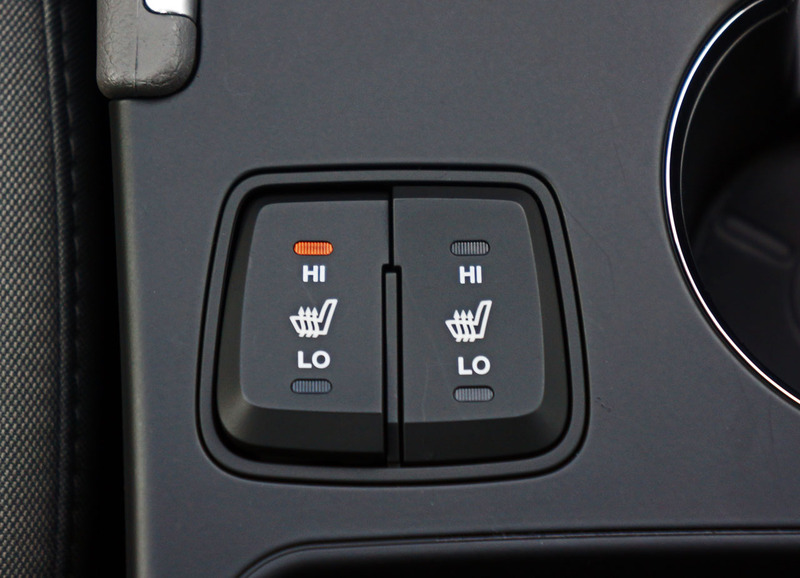 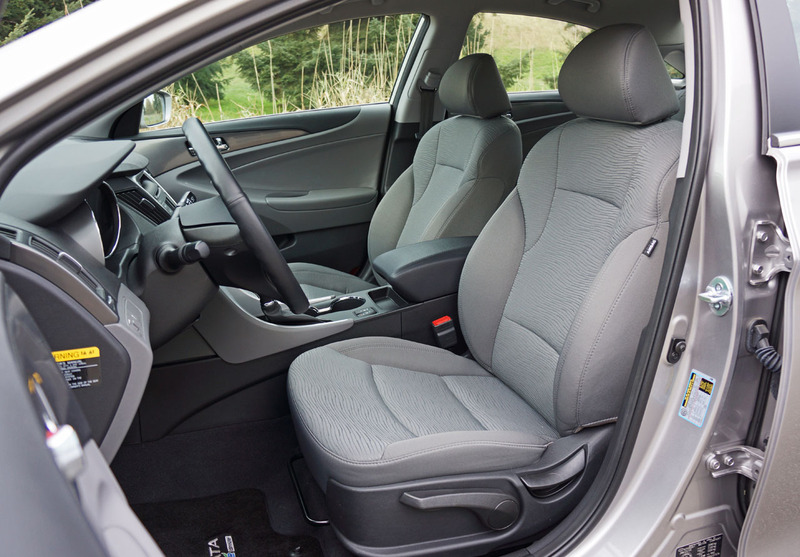 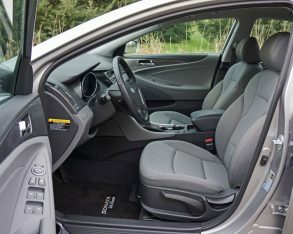 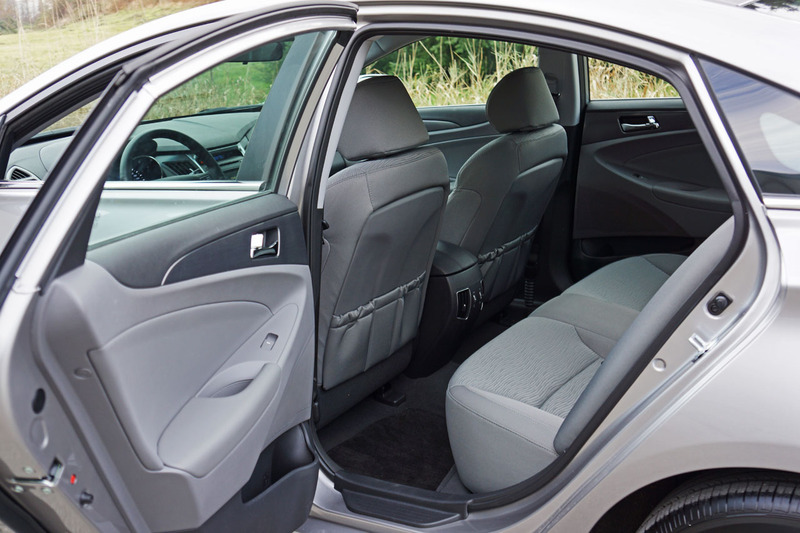 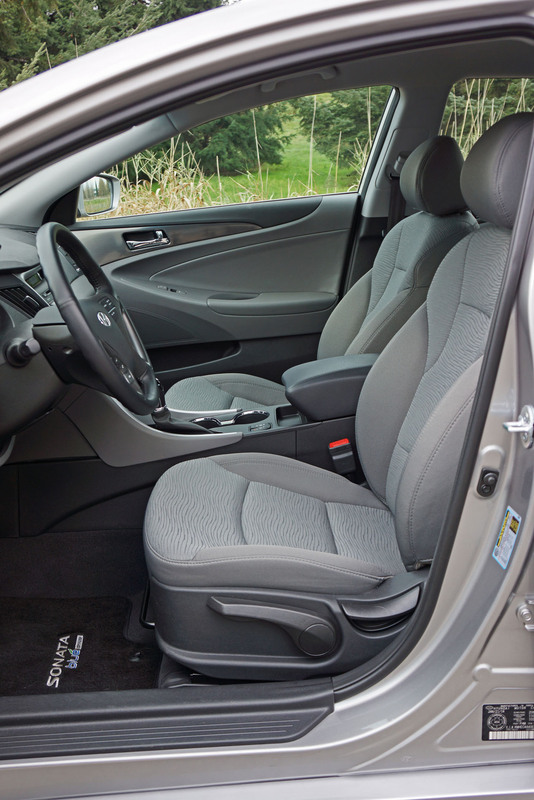 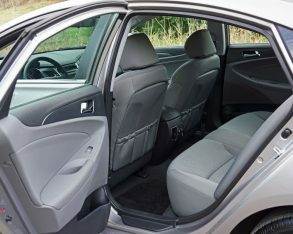 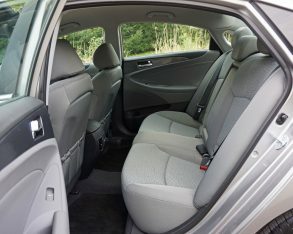 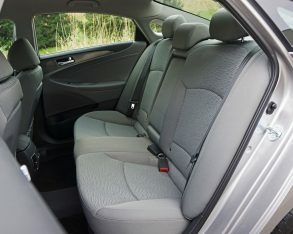 Comfort in mind, front and rear seats fit nicely and offer ample support thanks to six-way adjustability, although I’d like to try the eight-way powered driver’s seat from the Limited model to see how much better life can be. 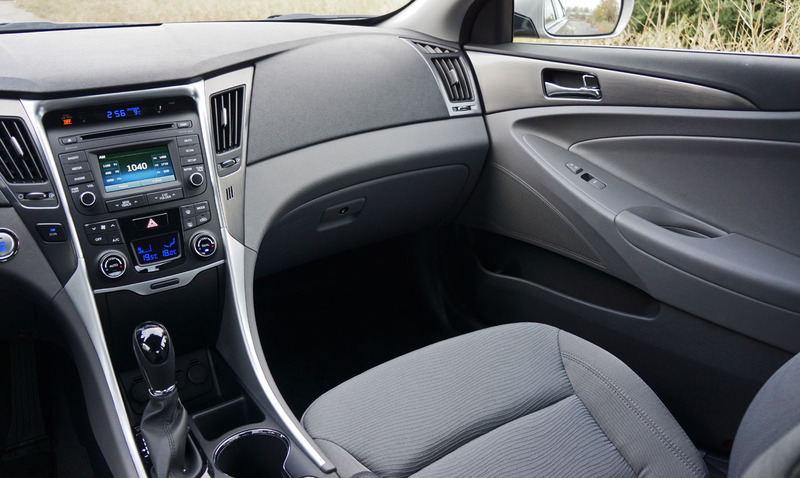 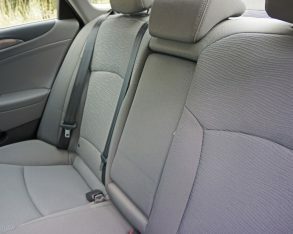 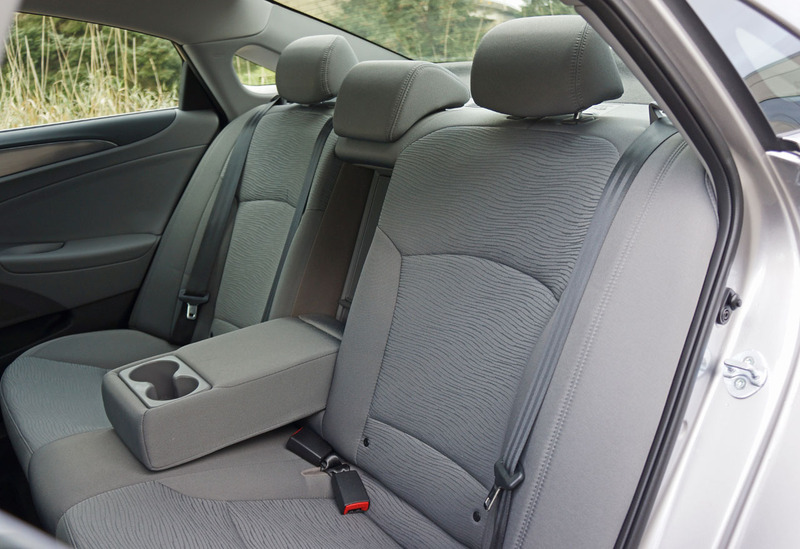 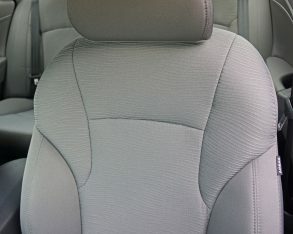 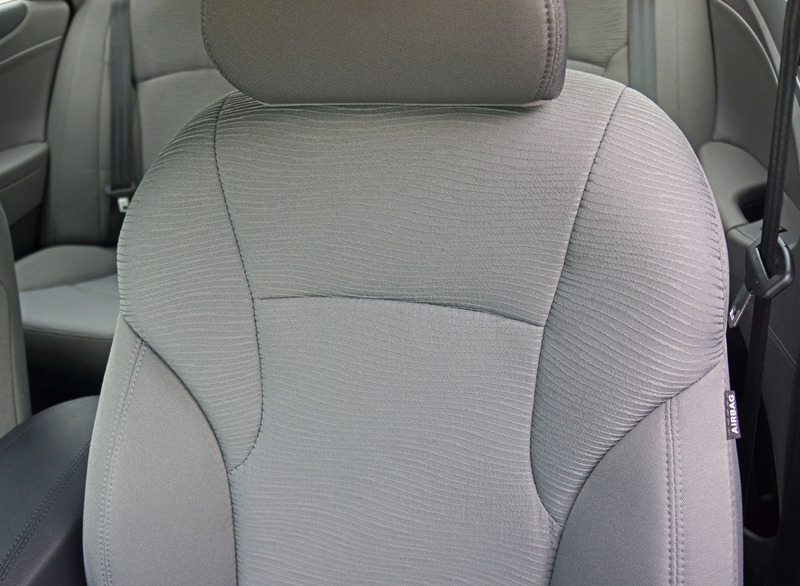 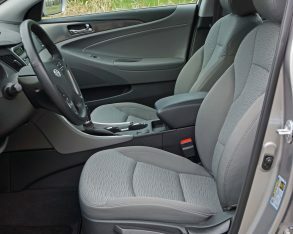 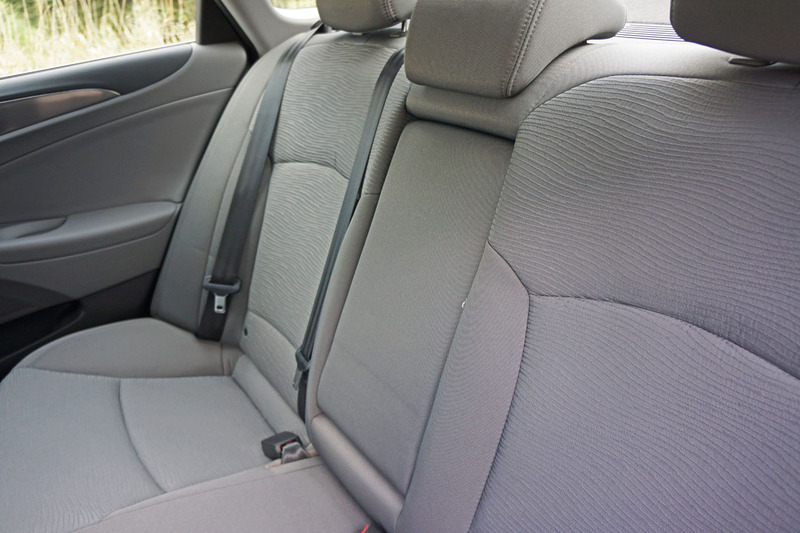 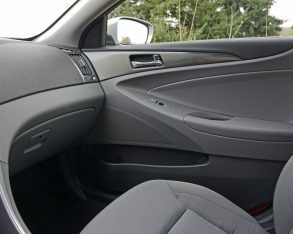 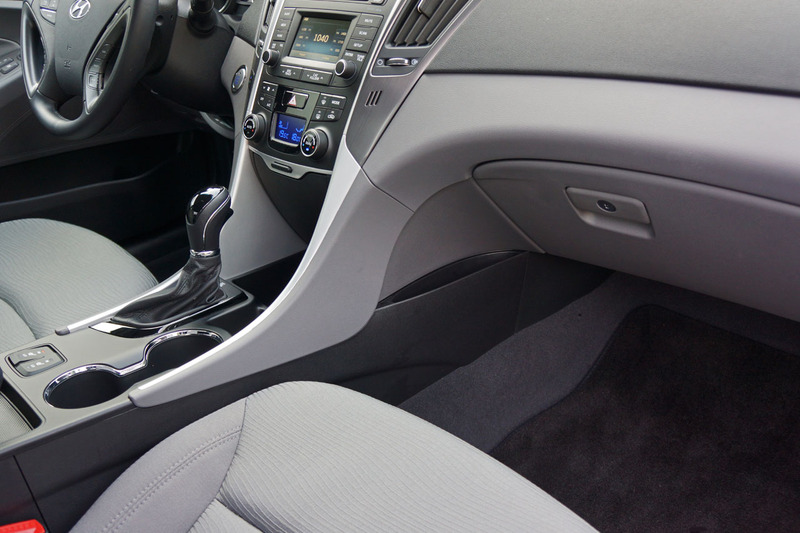 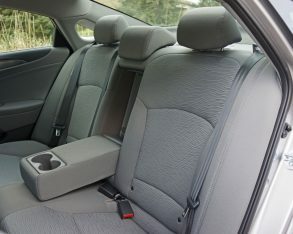 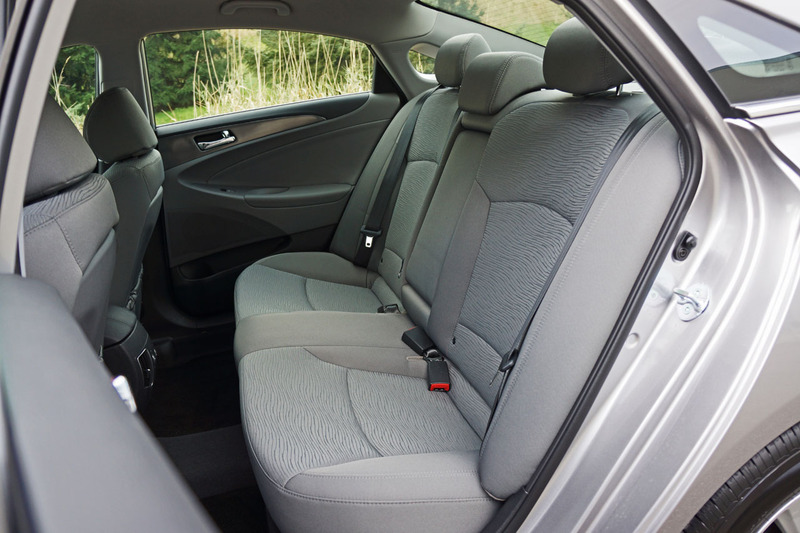 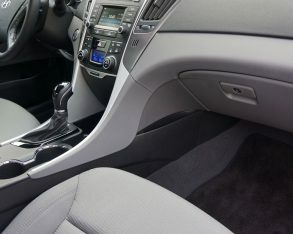 The tightly woven light-grey cloth upholstery that covers the seats of my standard Sonata Hybrid as well as the Limited version looks great, especially the wavy pattern on the insets. 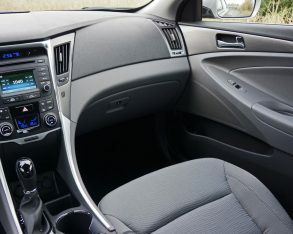 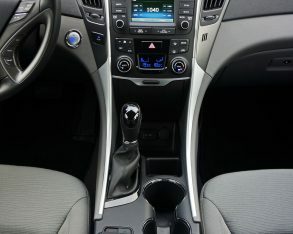 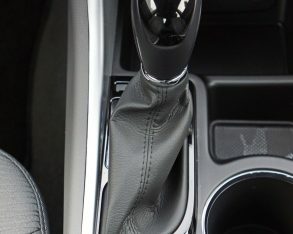 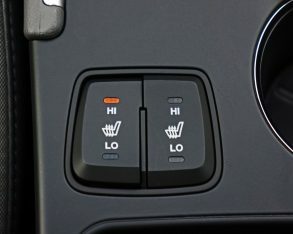 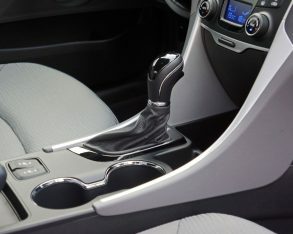 although a $3,800 Technology package can be added to the Limited that’s really a trim level of its own as it includes leather upholstery, a nicer 7.0-inch infotainment touchscreen with navigation, a nine-speaker 400-watt Infinity audio system, heated rear seats, and deluxe door scuff guards, whereas the Limited only adds that aforementioned eight-way powered driver’s seat, plus an auto-dimming rearview mirror with an integrated compass and Homelink garage door opener, a power tilt and slide panoramic sunroof and rear reading lights. 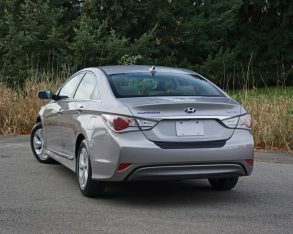 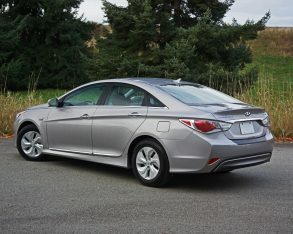 standard Sonata Hybrid came well equipped too, with proximity-sensing keyless entry with pushbutton ignition, automatic headlights with LED accents, heated and powered side mirrors, variable-intermittent speed-sensitive wipers, a multi-function leather-wrapped tilt and telescopic steering wheel, a leather-covered gearshift knob, and heated front seats. 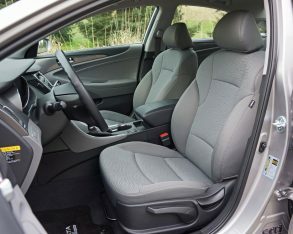 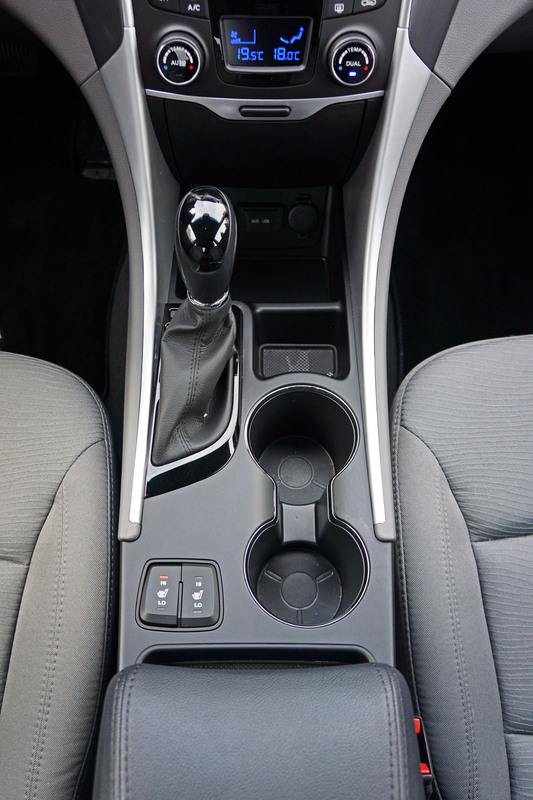 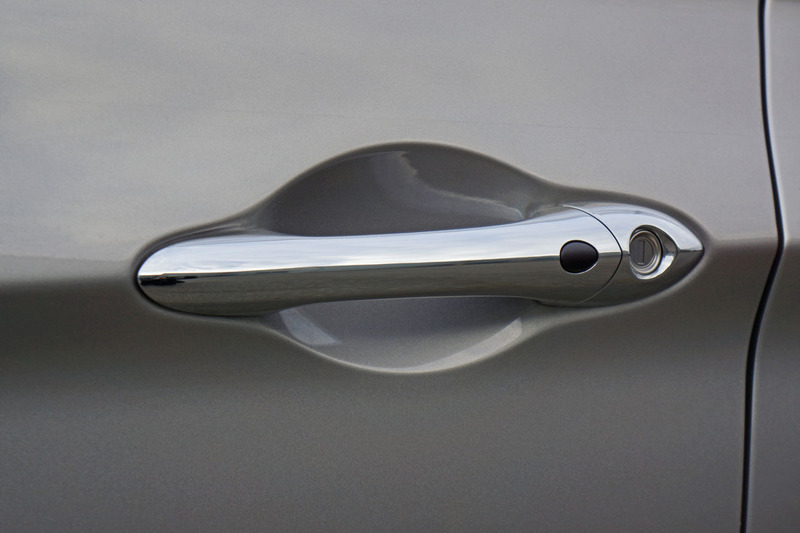 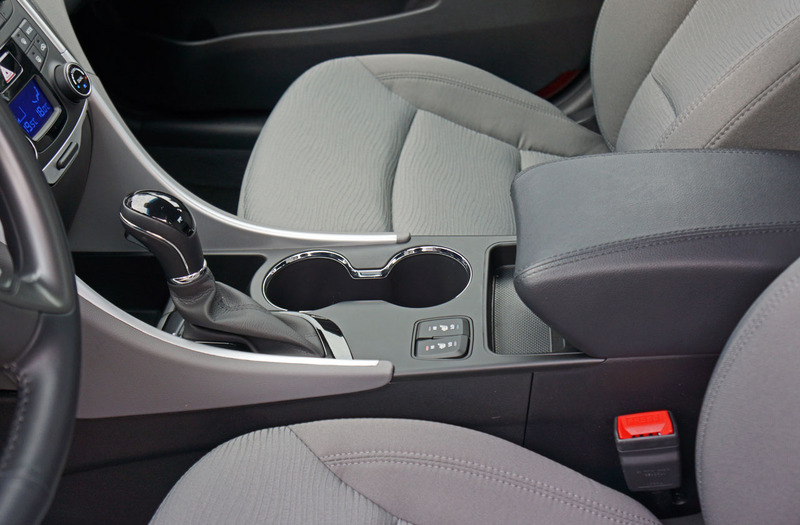 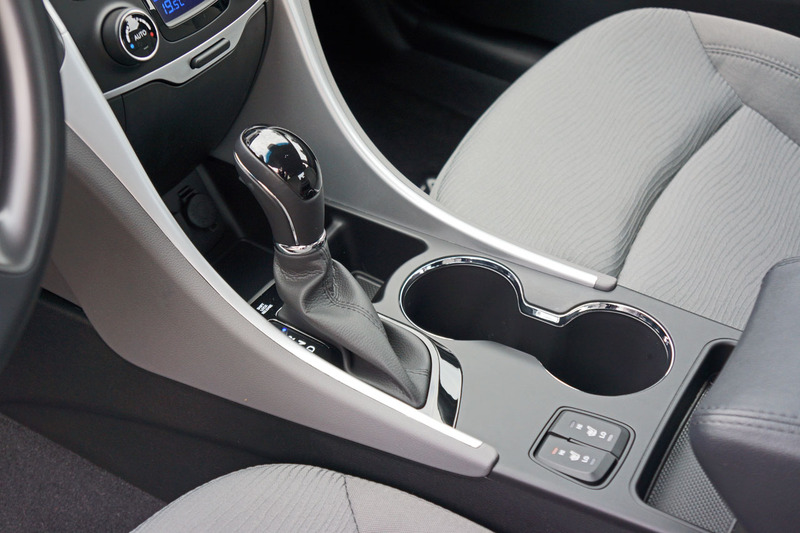 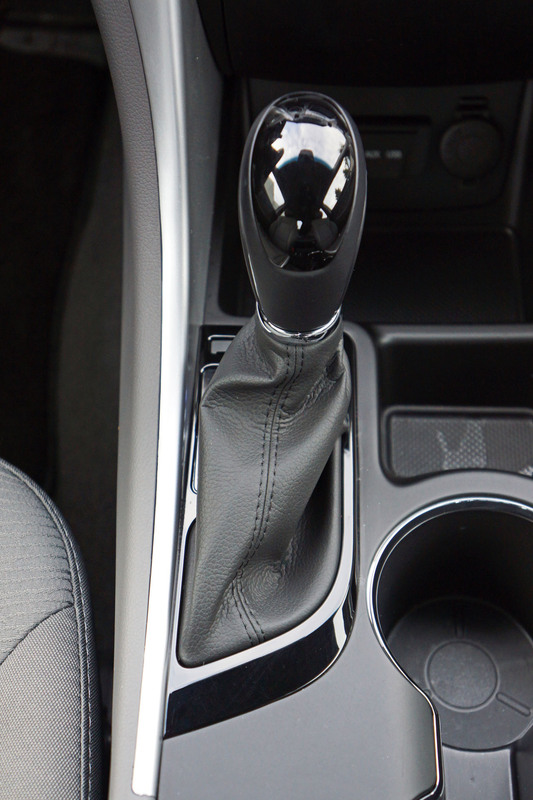 Standard safety items include all the usual airbags, active front head restraints, traction and stability control, ABS-enhanced four-wheel disc brakes with electronic brake-force distribution and emergency brake assist, and more. 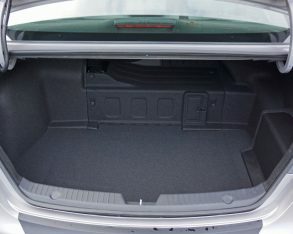 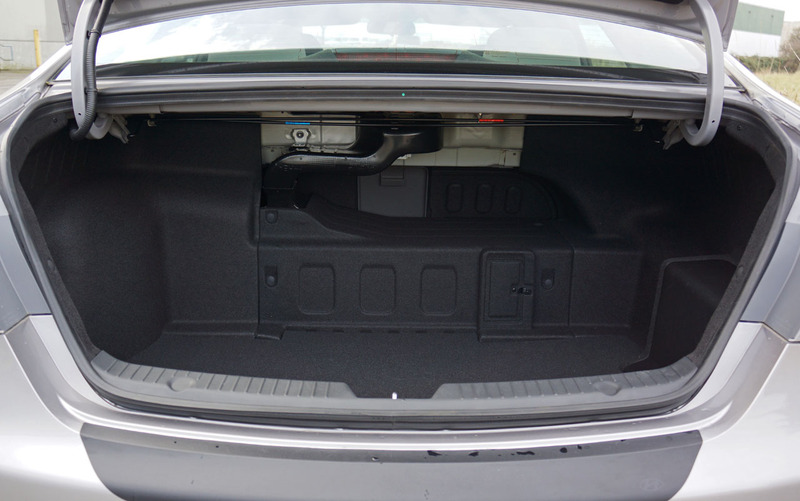 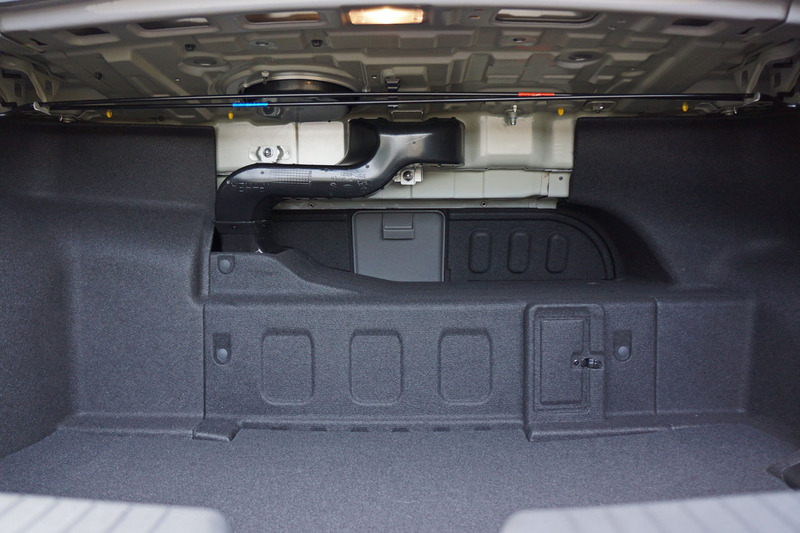 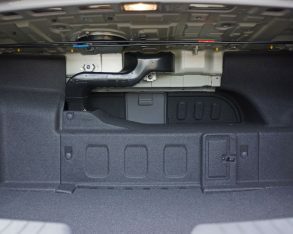 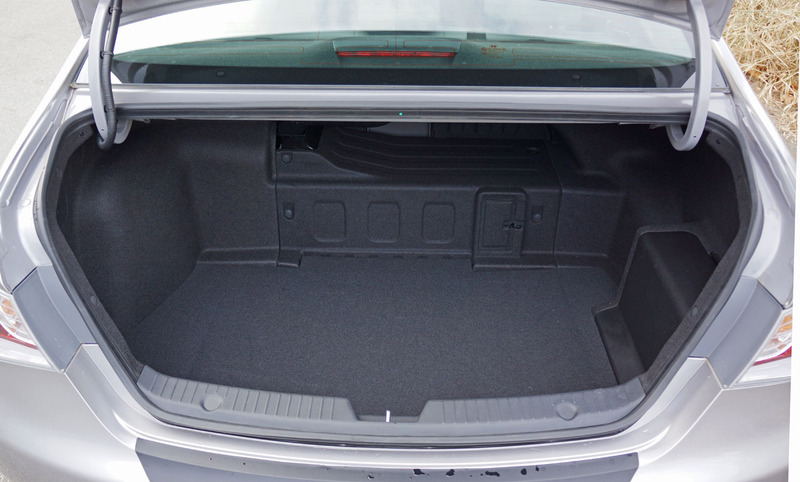 Hybrid’s trunk is fairly large at 344 litres, although that’s still 120 litres shy of the conventionally powered 2014 Sonata. 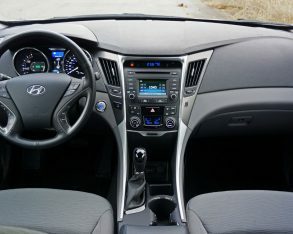 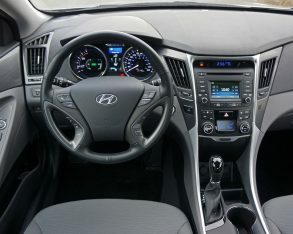 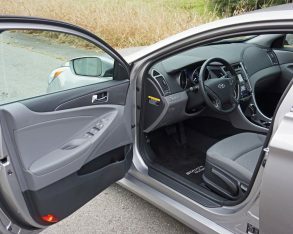 The Sonata Hybrid is also quite quiet, letting in very little outside noise even when parked amid the hustling and bustling downtown core. 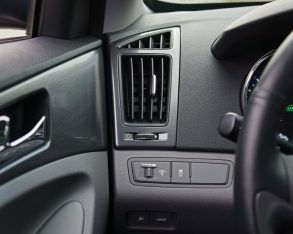 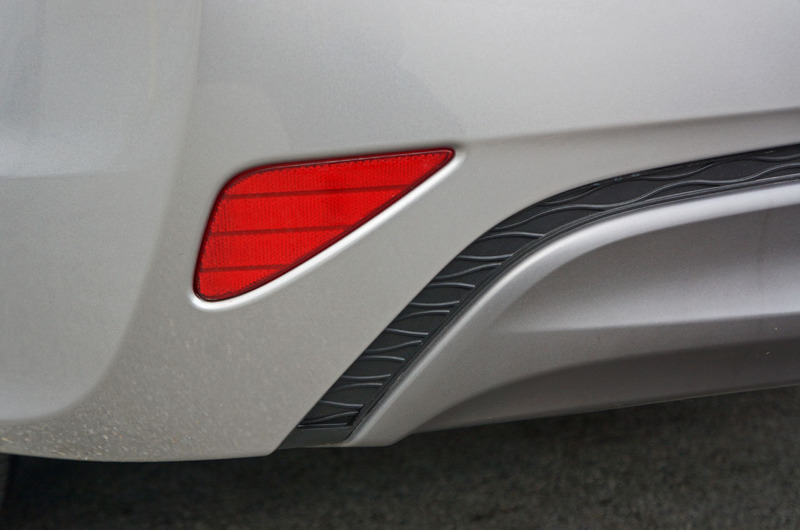 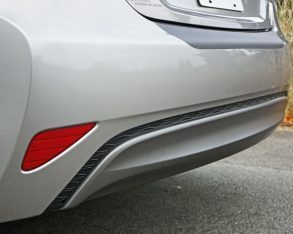 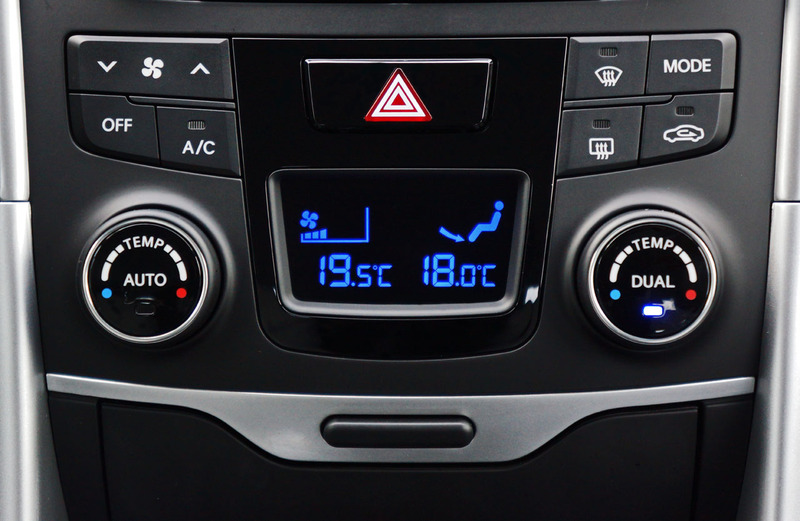 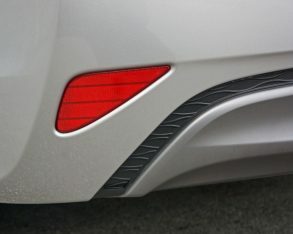 Its quietness is even more apparent while driving, as road noise and wind noise are kept to a minimum due to plenty of insulation as well as the car’s slippery shape, the latter resulting in a 0.25 coefficient of drag (Cd). 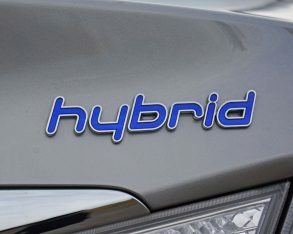 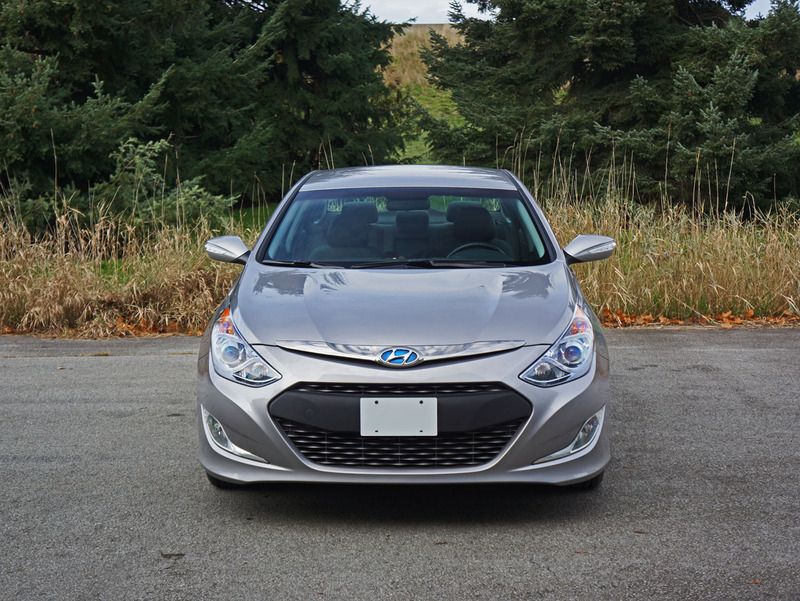 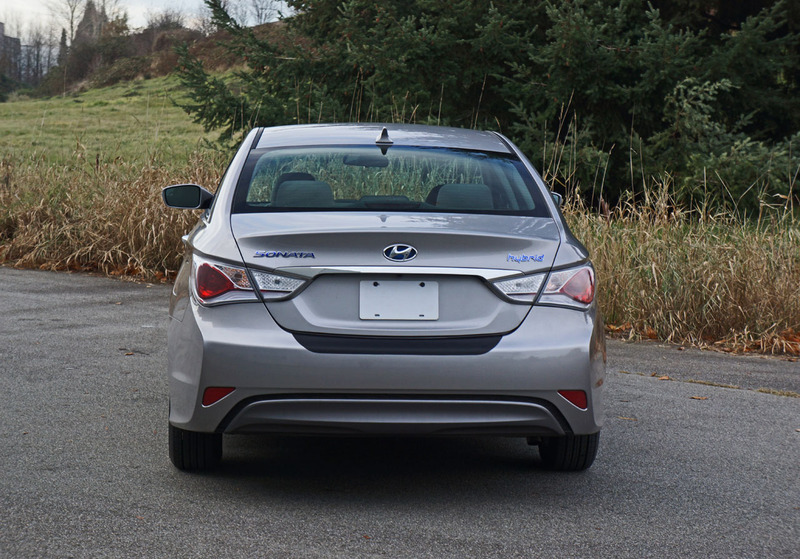 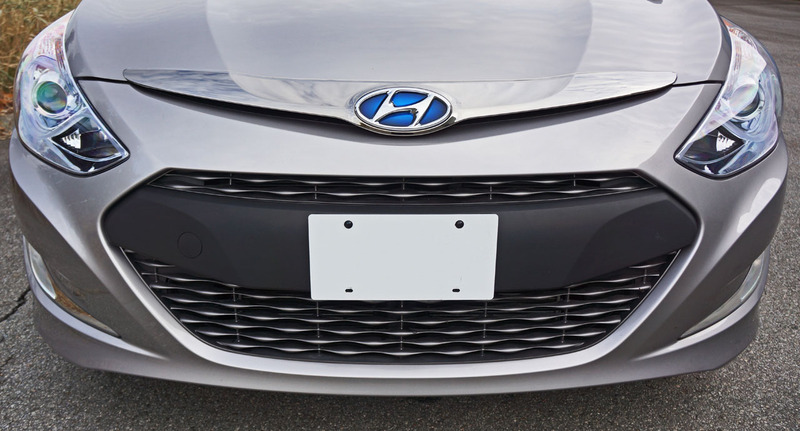 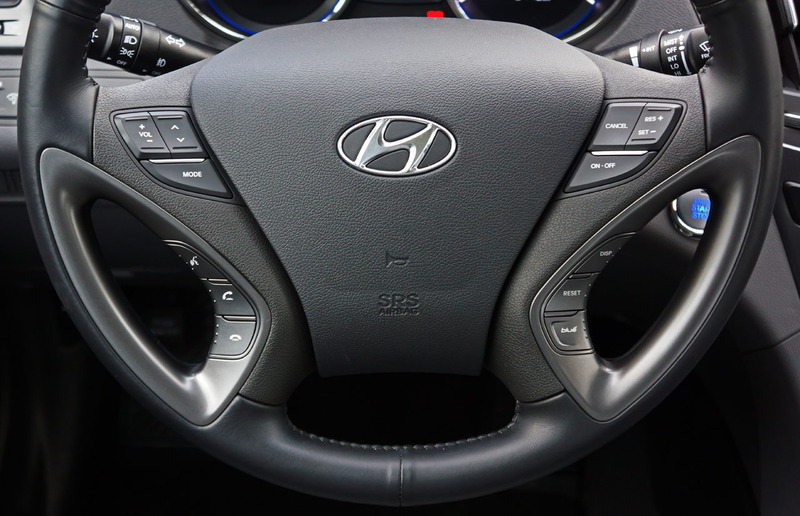 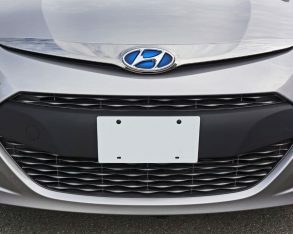 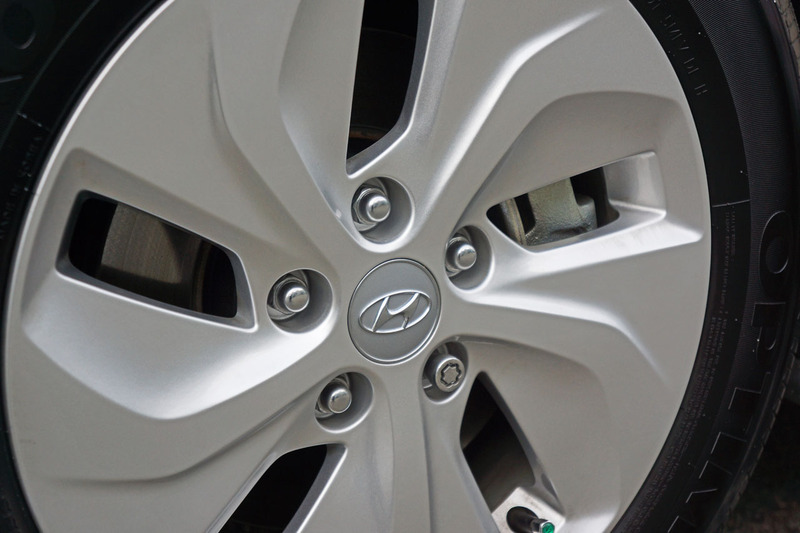 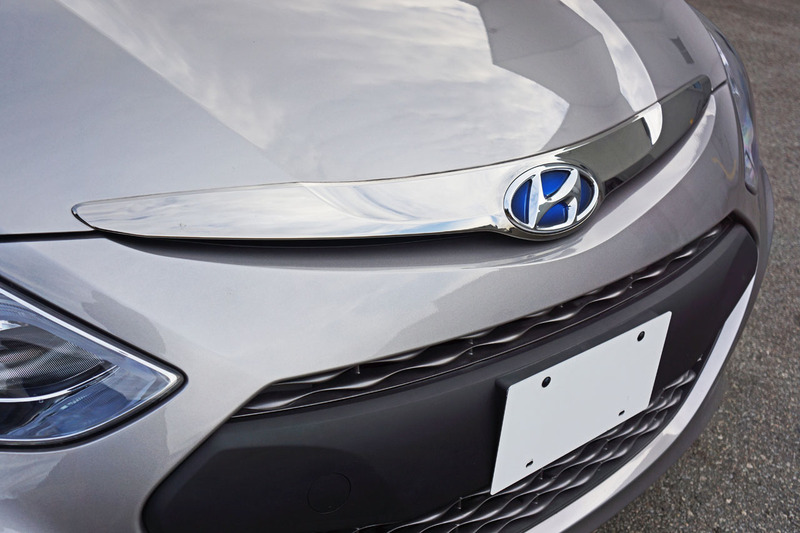 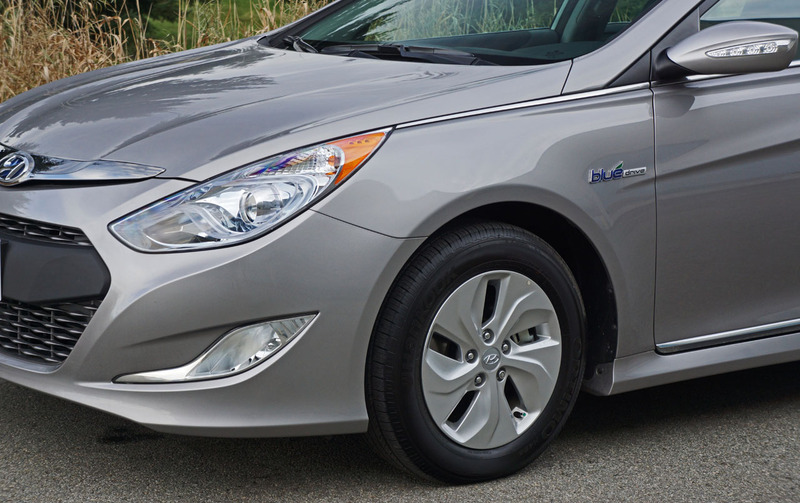 every other hybrid, Hyundai’s HEV uses an automatic engine start-stop system to save fuel while stationary and otherwise idling, while regenerative braking collects what would be wasted kinetic energy and sends it back through the electrical system. 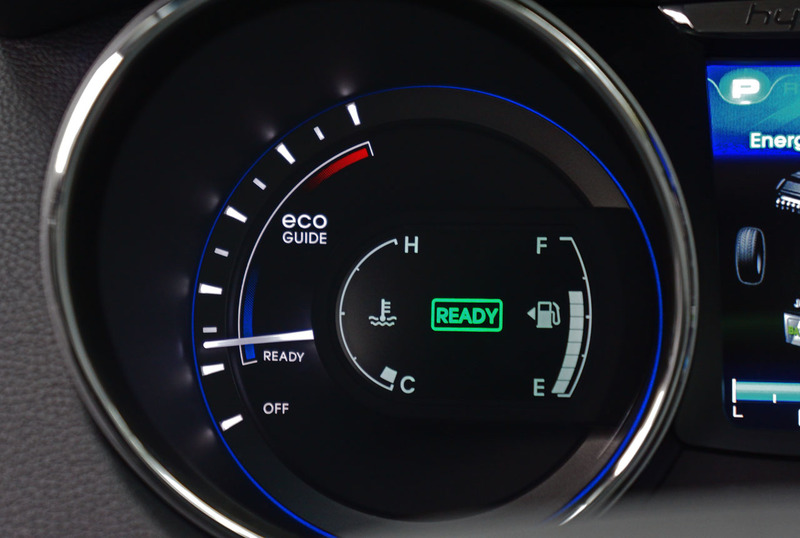 All of this green goodness results in an ultra-clean SULEV II (PZEV) emissions rating. 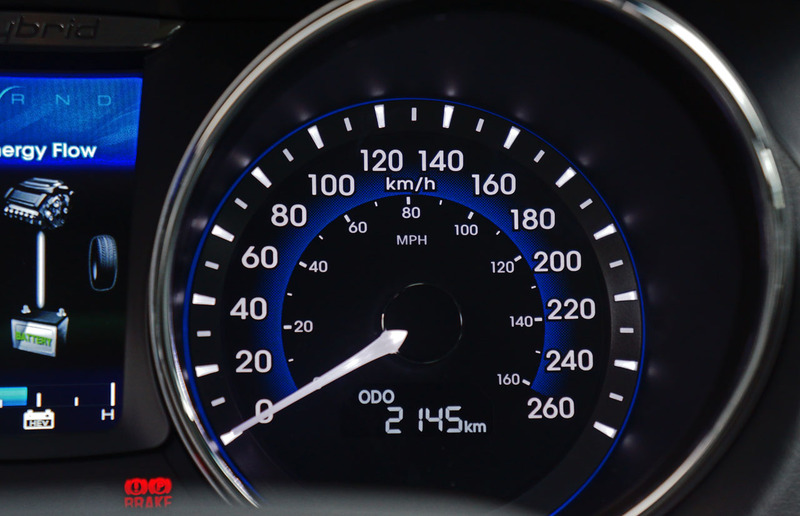 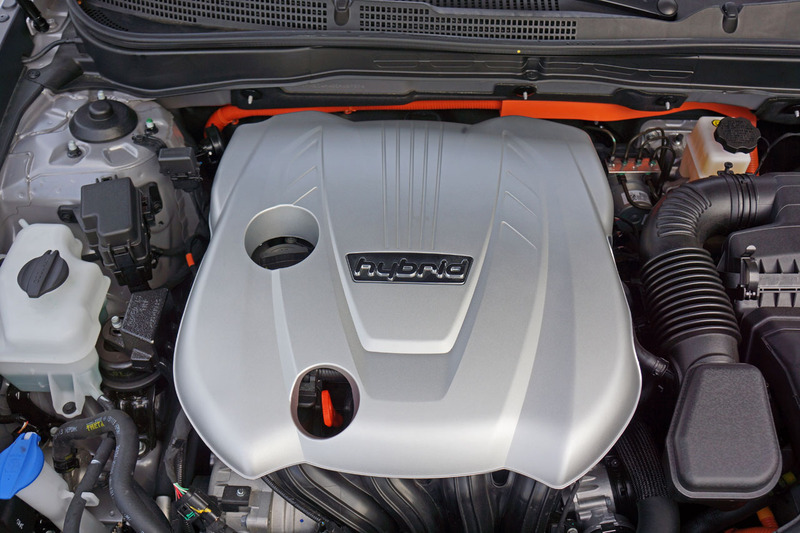 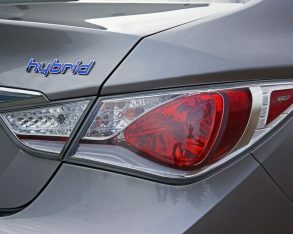 but when combined with the 47 horsepower and 151 lb-ft of torque from the hybrid system’s permanent-magnet synchronous motor, 100-percent of that twist which is available from zero to 1,630 rpm, power increases to 199 and torque to 235 lb-ft, so it’s no wonder this car feels quick when putting my right foot into it. 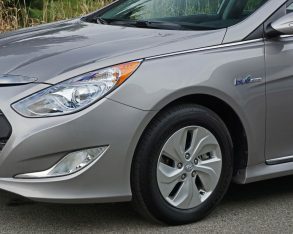 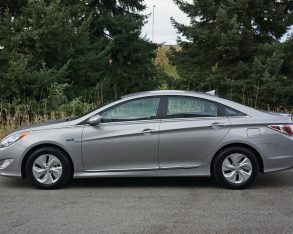 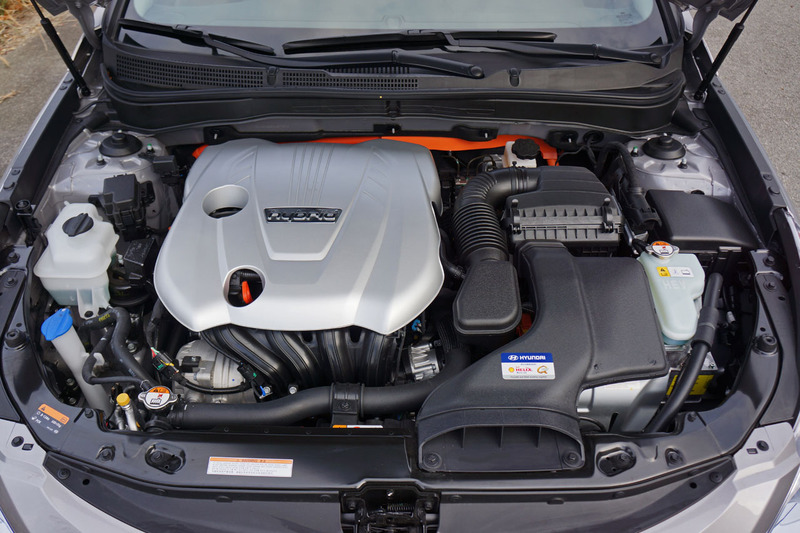 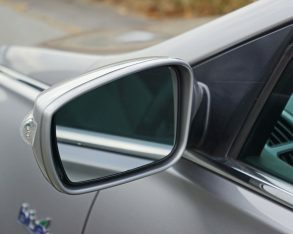 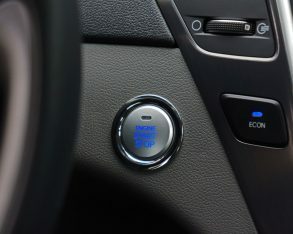 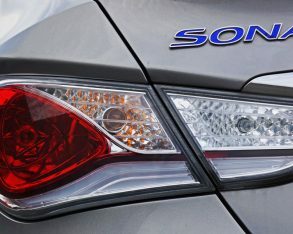 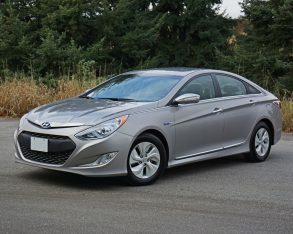 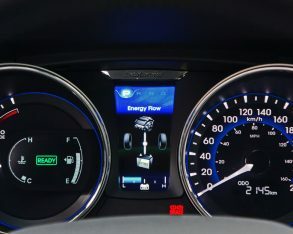 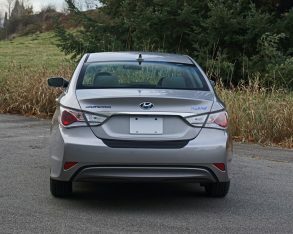 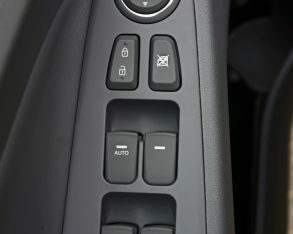 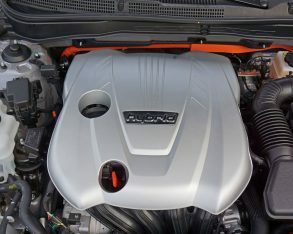 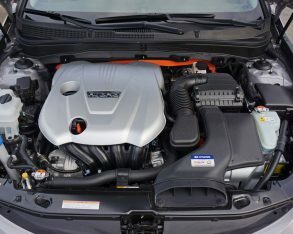 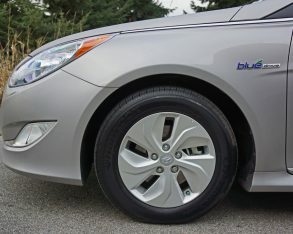 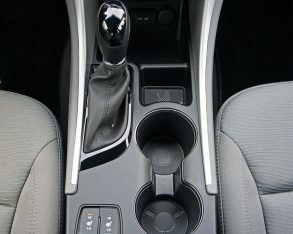 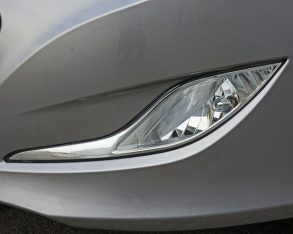 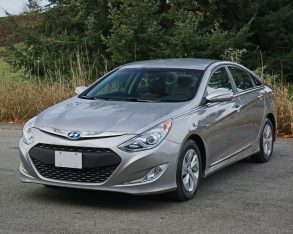 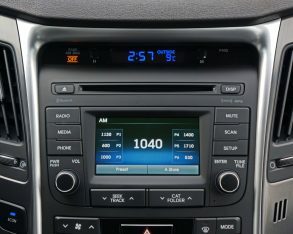 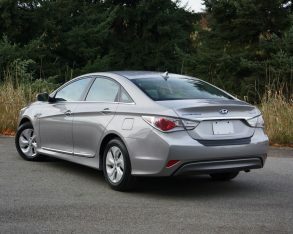 Also impressive, the 47-kW battery is a lithium-ion polymer type, not an older tech nickel-metal hydride unit as used by the Camry Hybrid, while the Sonata Hybrid feels a lot more like a conventionally powered sedan than its contemporaries thanks to a regular six-speed automatic transmission that even includes sporty manual mode, most hybrids using a fun-robbing continuously variable transmission (CVT) instead. 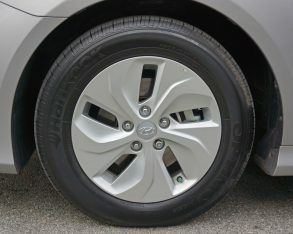 on more conventional Hankook Optimo 205/65R16 grand touring all-season tires specifically developed for “sporty sedans” says the South Korean tire manufacturer, instead of the poor grip and harsh ride of low rolling resistance rubber used on some hybrids. 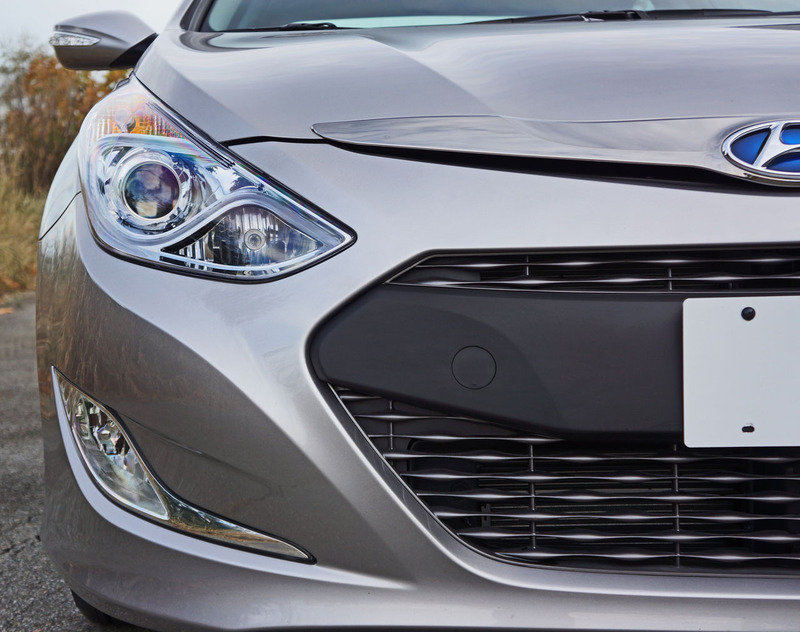 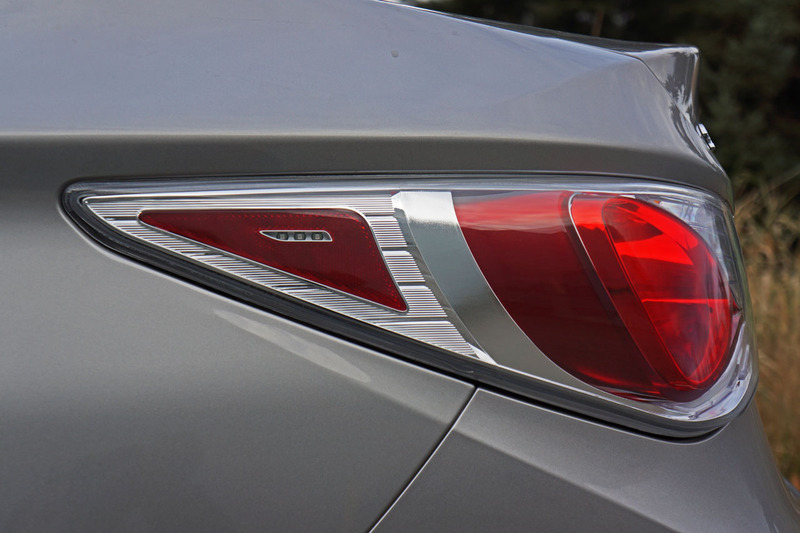 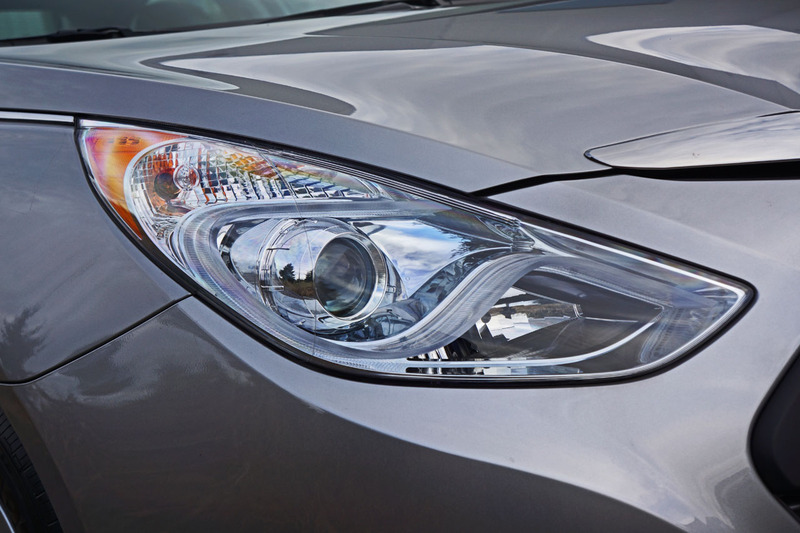 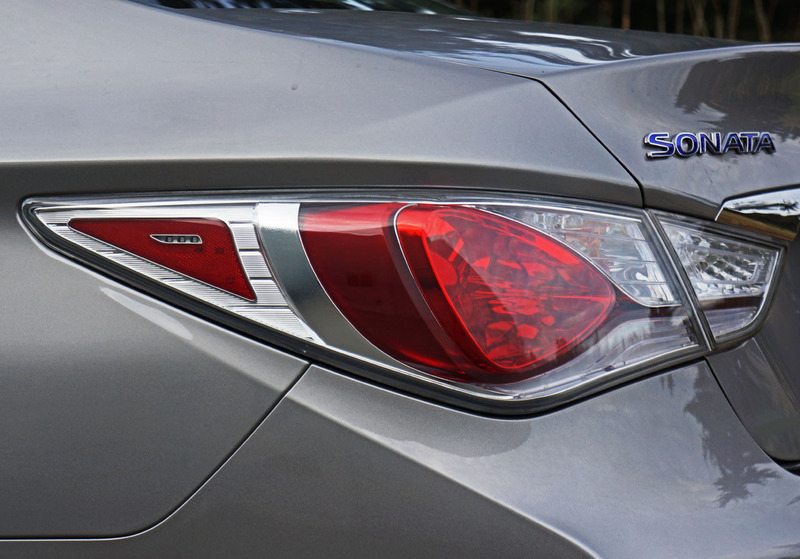 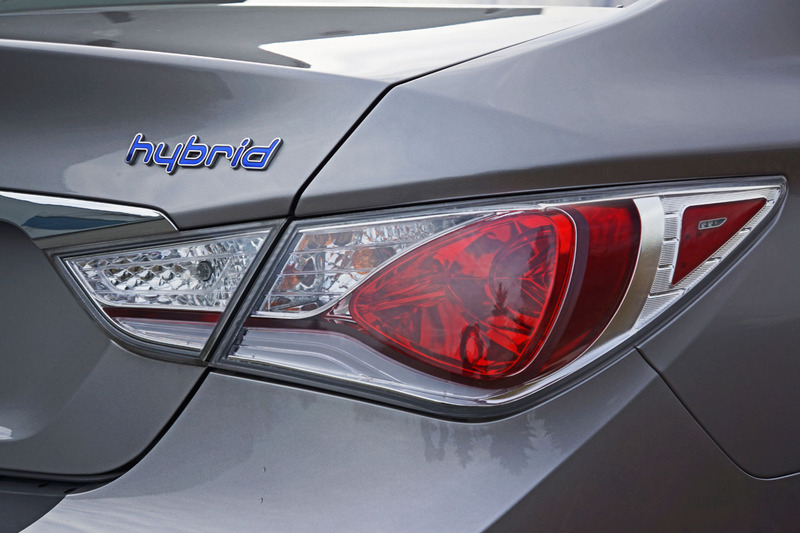 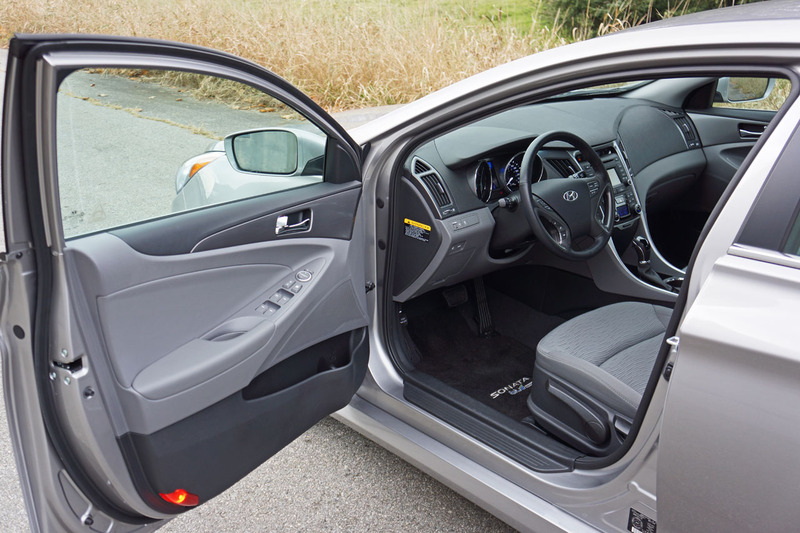 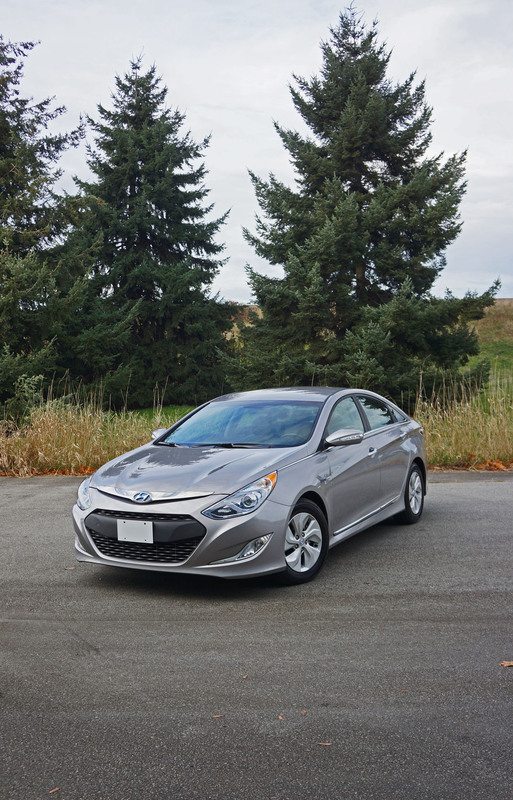 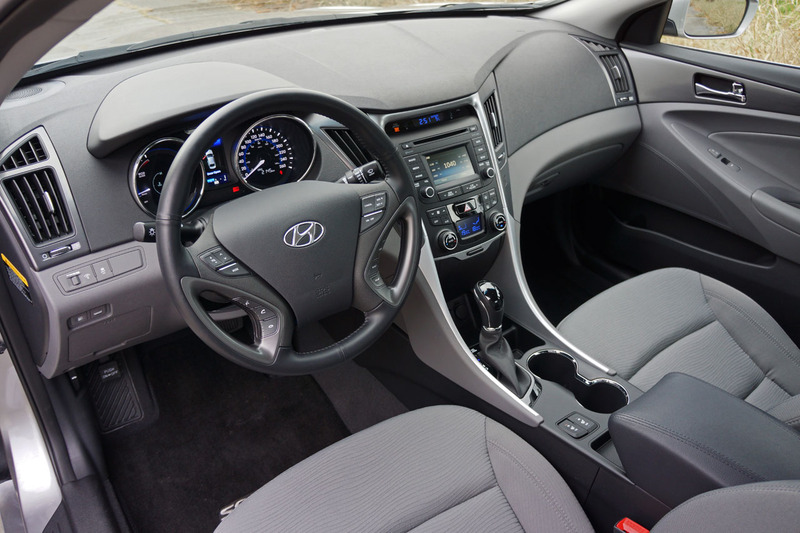 While capable through the corners the Sonata Hybrid feels most at home around town or on the highway where it remains smooth and stable, capable of cruising all day long. 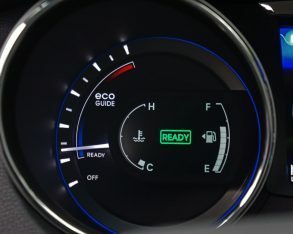 as well as reworked engine on/off optimization logic, which all comes together to achieve more electric range and therefore what should be bigger savings at the pump. 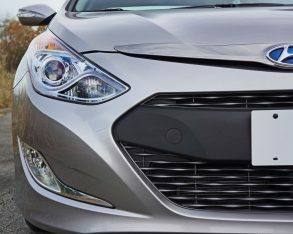 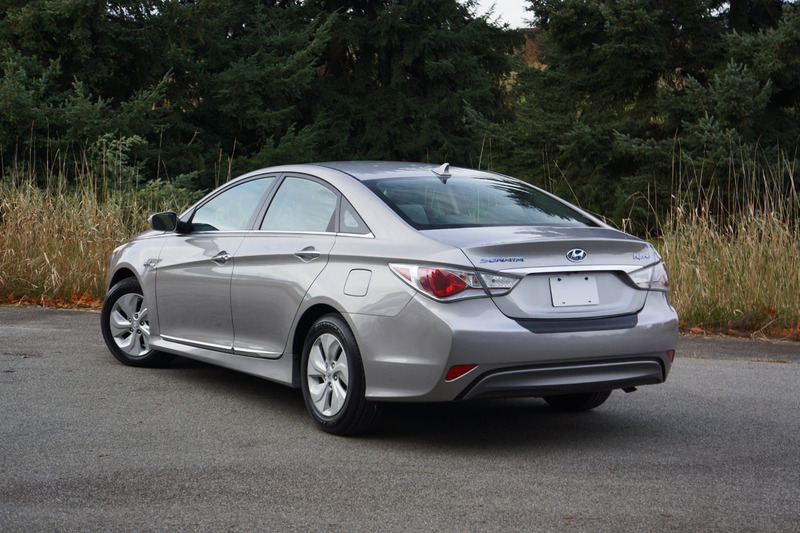 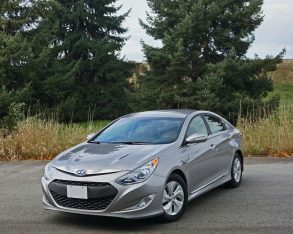 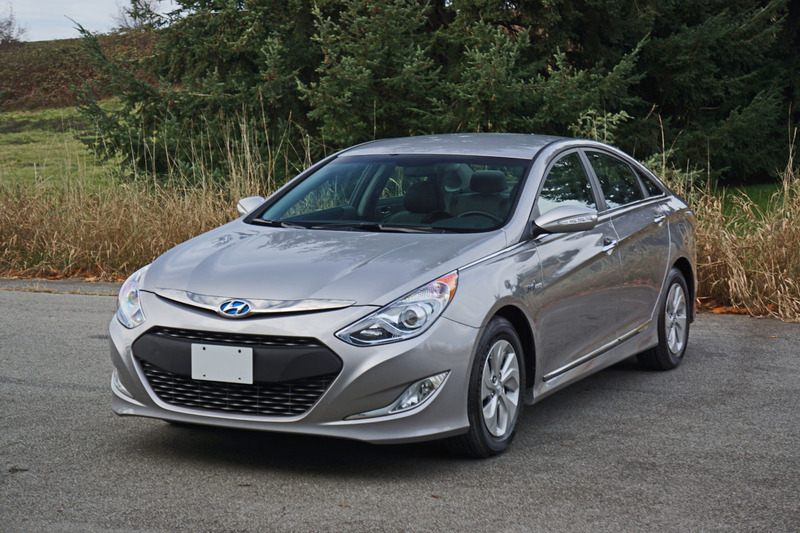 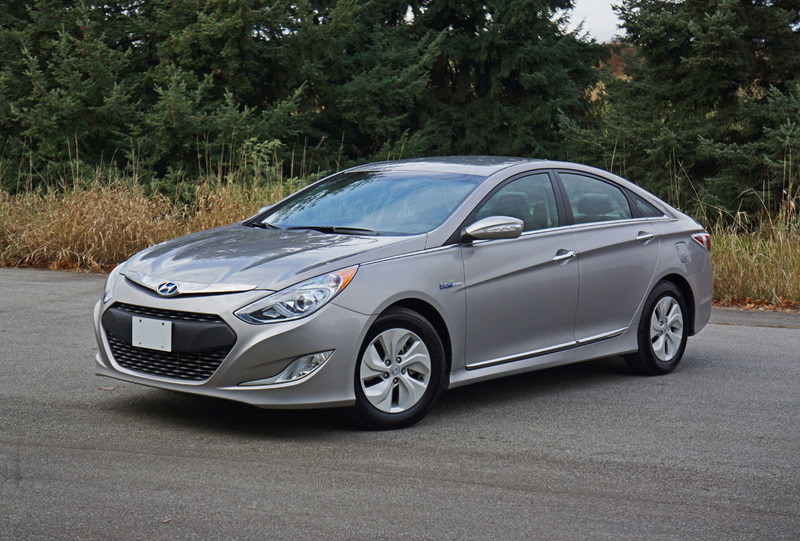 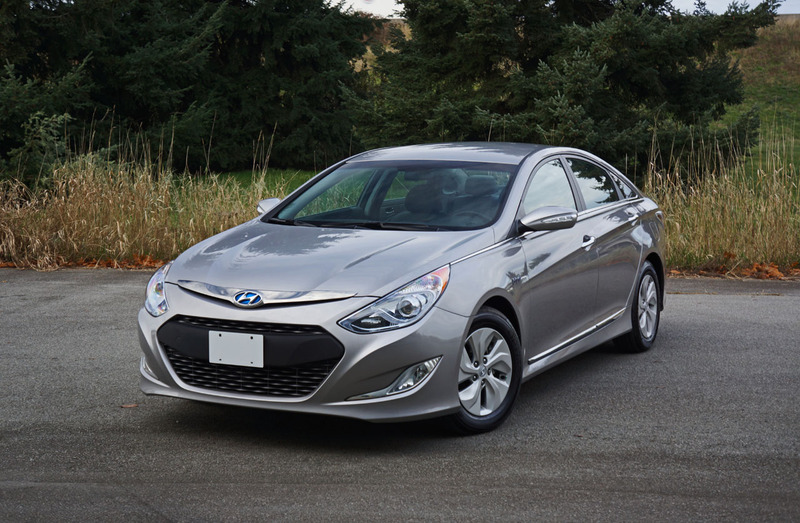 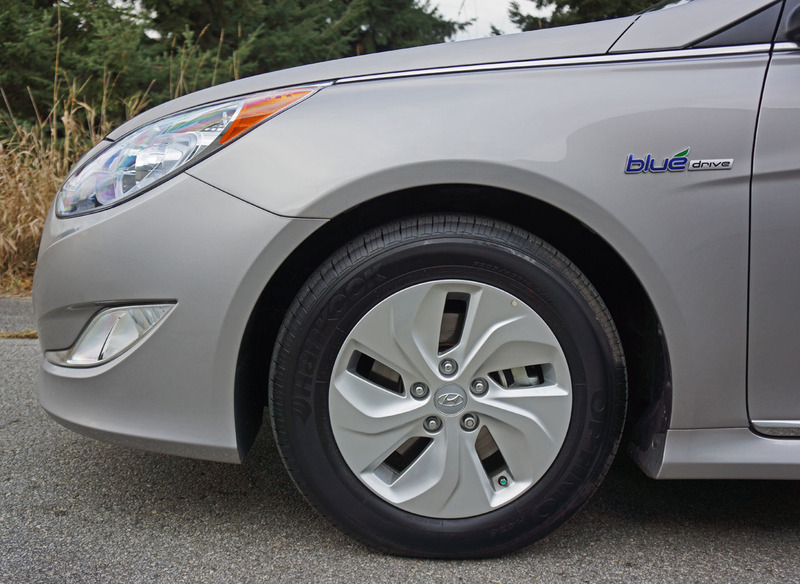 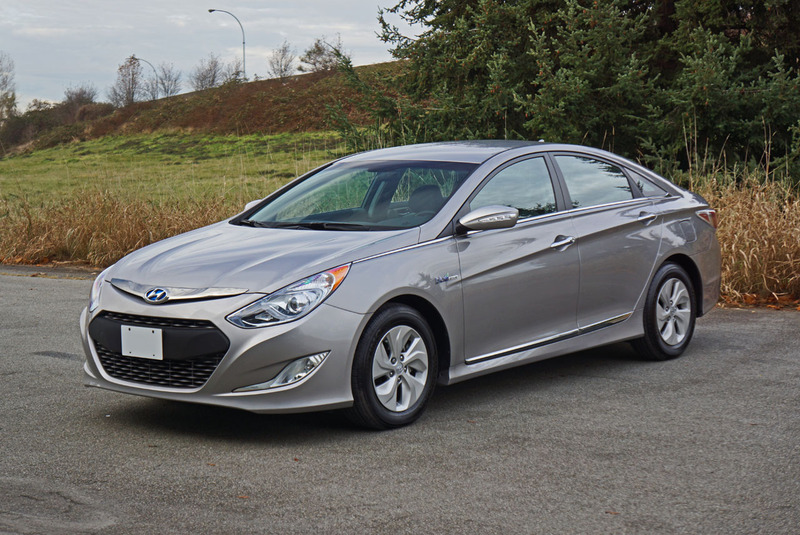 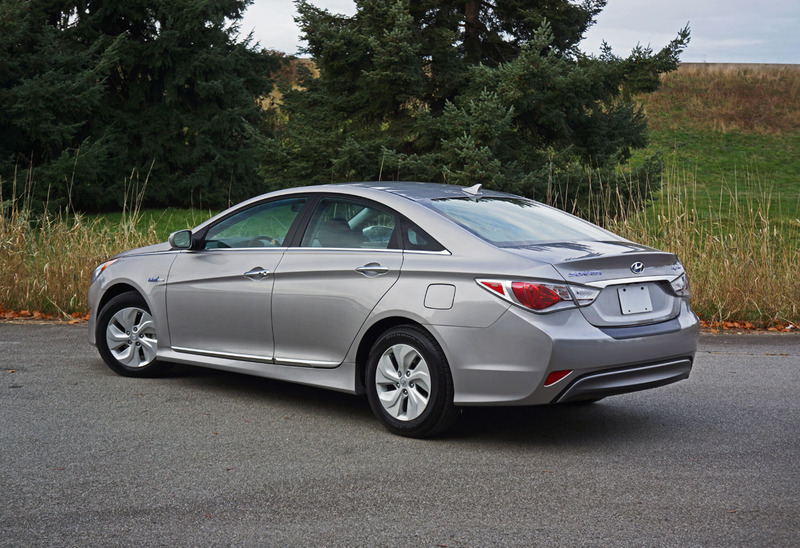 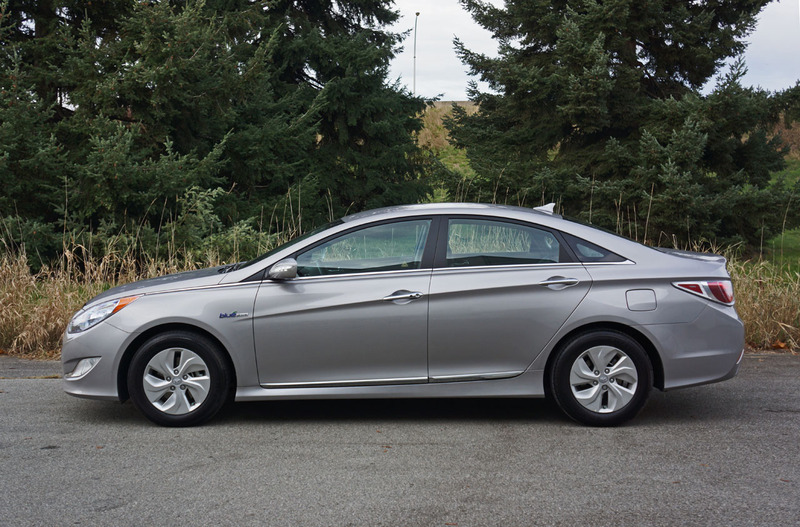 If you like what you’ve read so far, this is an especially good time to consider a 2014 Sonata Hybrid as the completely unchanged 2015 model is already arriving on dealer lots, prompting a sizable $5,000 discount from Hyundai Canada on the outgoing model. 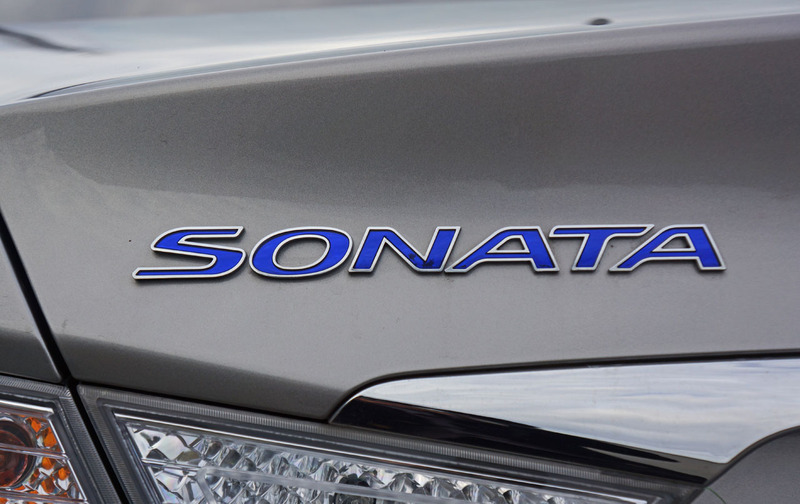 This means you can silently drive away with a state of the art midsize Sonata Hybrid for as little as $23,249 plus freight. 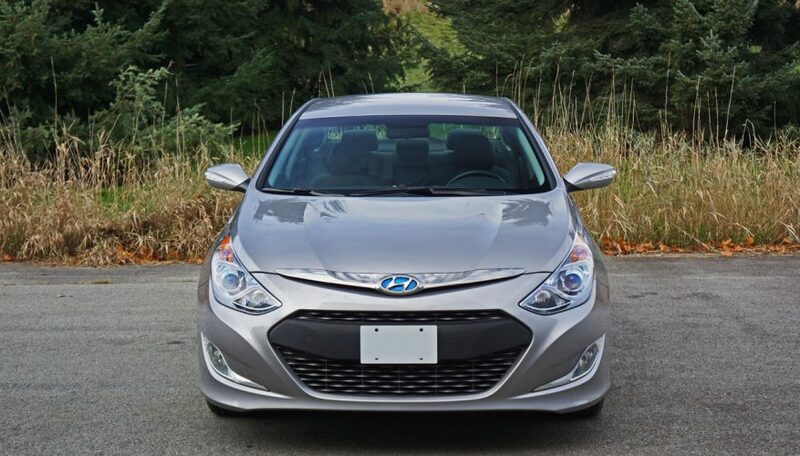 Should I just shut up now and let you call your local dealer to set up a test drive? 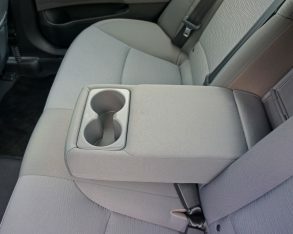 Yah, enough said.